Whitefriars Glass dates from sometime in the 1600s. The original site had been occupied by a community of Carmelite monks known as White Friars, hence the name taken by the glass company. 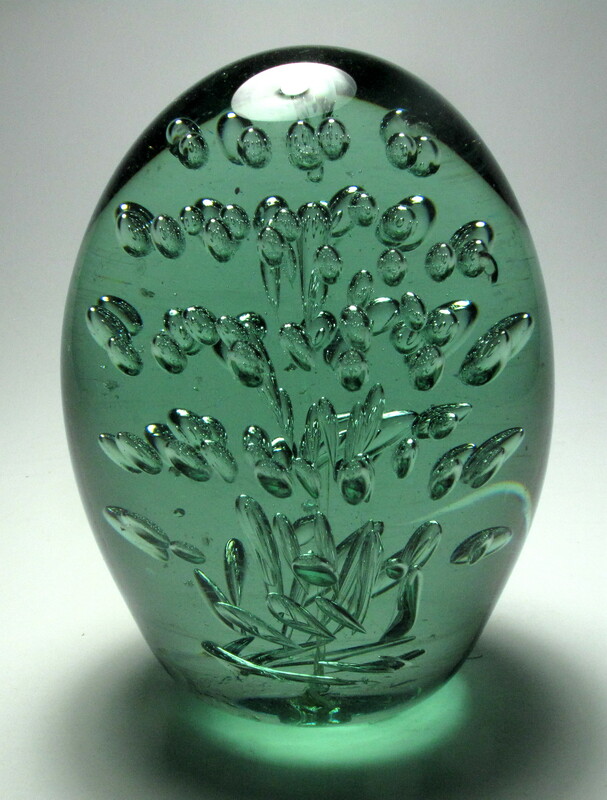 It was operated under the name of James Powell and Sons from 1834 to 1962, when it was renamed Whitefriars Glass. In 1980 they went out of business. 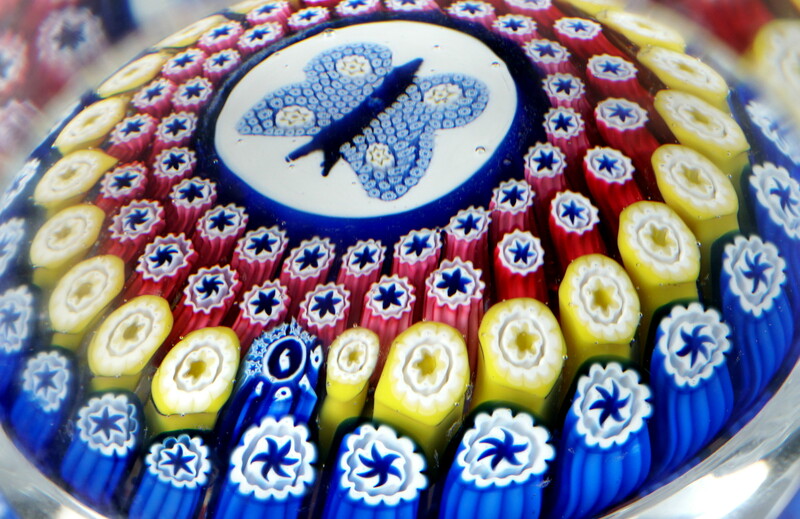 After Whitefriars Glass was liquidated, Caithness Glass purchased the rights to the name and produced paperweights under the Whitefriars name for a while. A quick summary of English paperweight production is given below. 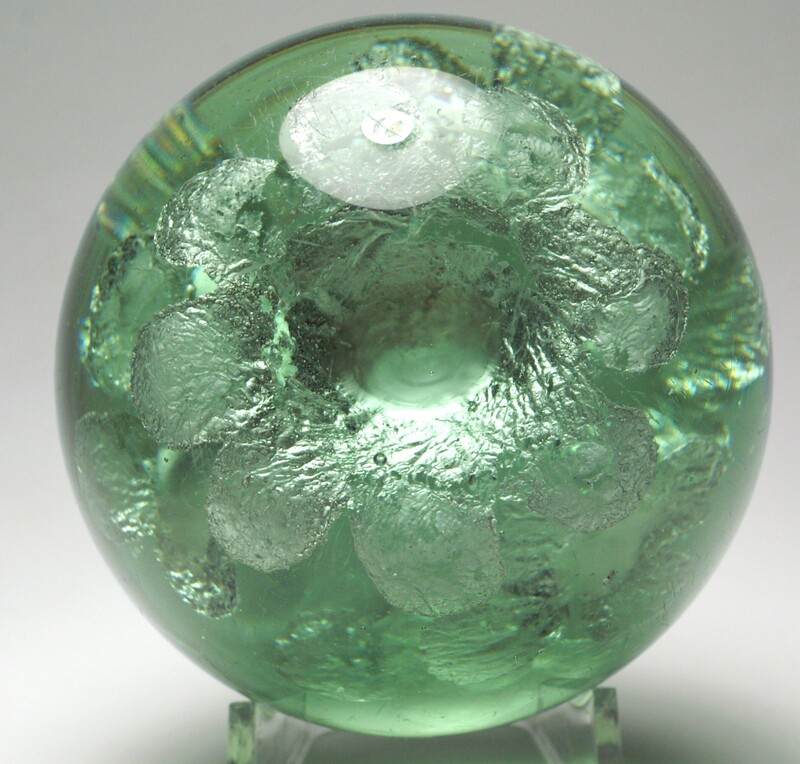 See the excellent book Old English Paperweights by Robert Hall for more detail. 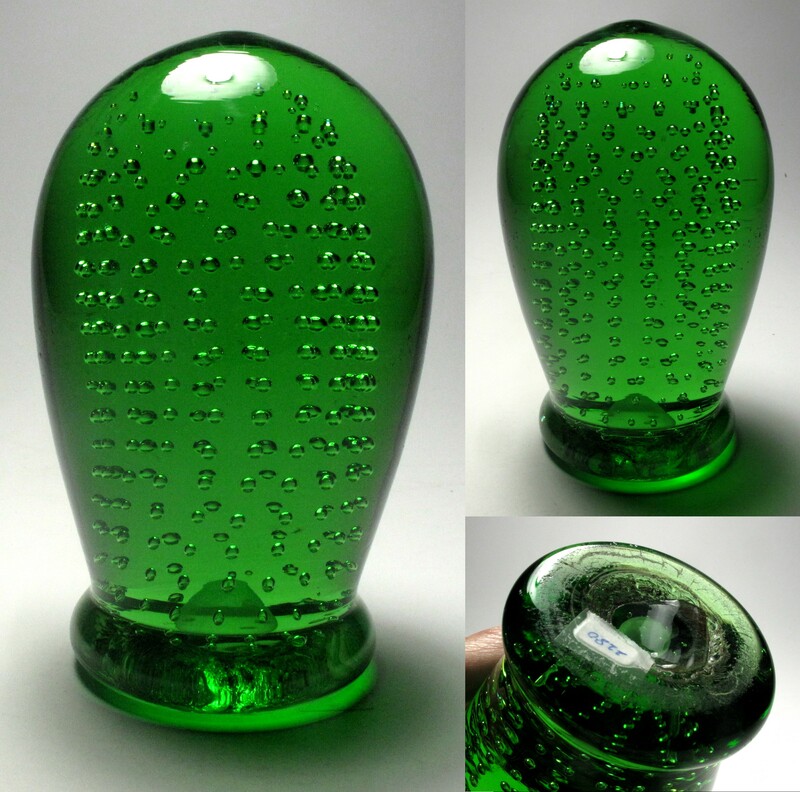 John Kilner produced green dump paperweights or doorstops in Wakefield from 1829 on. The company named changed to Kilner Brothers in 1844. Production is believed to have continued until about 1855. 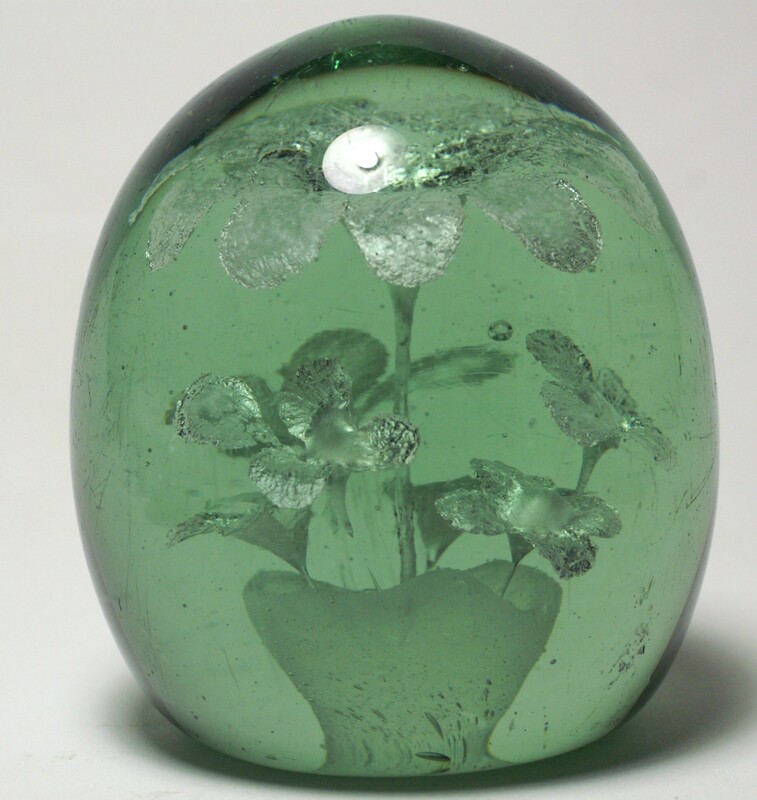 For a long time, collectors believed that English paperweights dated 1848 were made by Whitefriars. The dates, however, are false dates and have been traced to production at Arculus and Walsh-Walsh in the 1920s and 1930s. 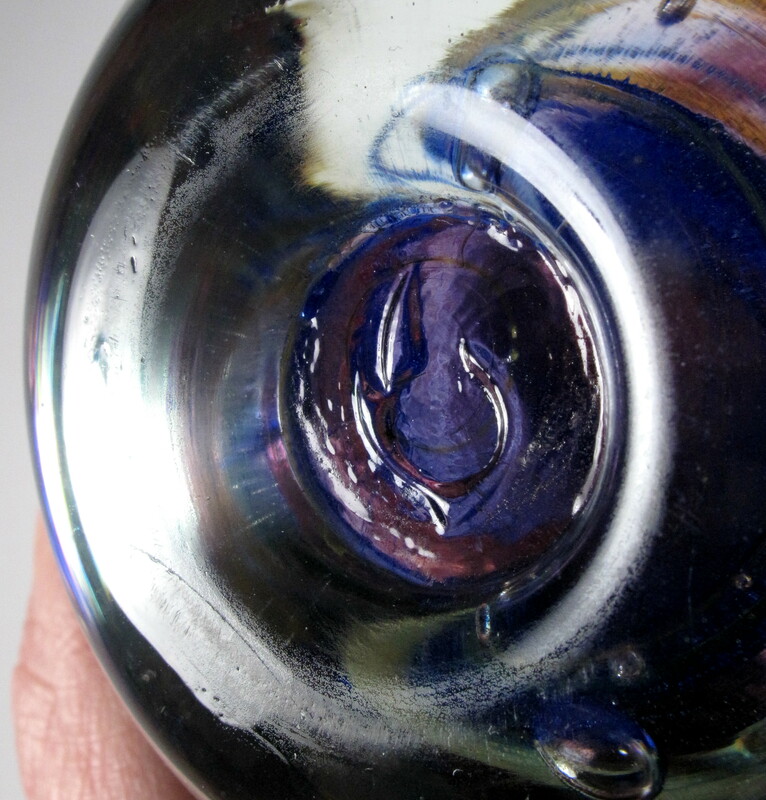 Most paperweights referred to as old Whitefriars or antique Whitefriars were, in fact, made by other factories such as Richardson, Arculus, Walsh-Walsh, or one of the unidentified Old English factories. 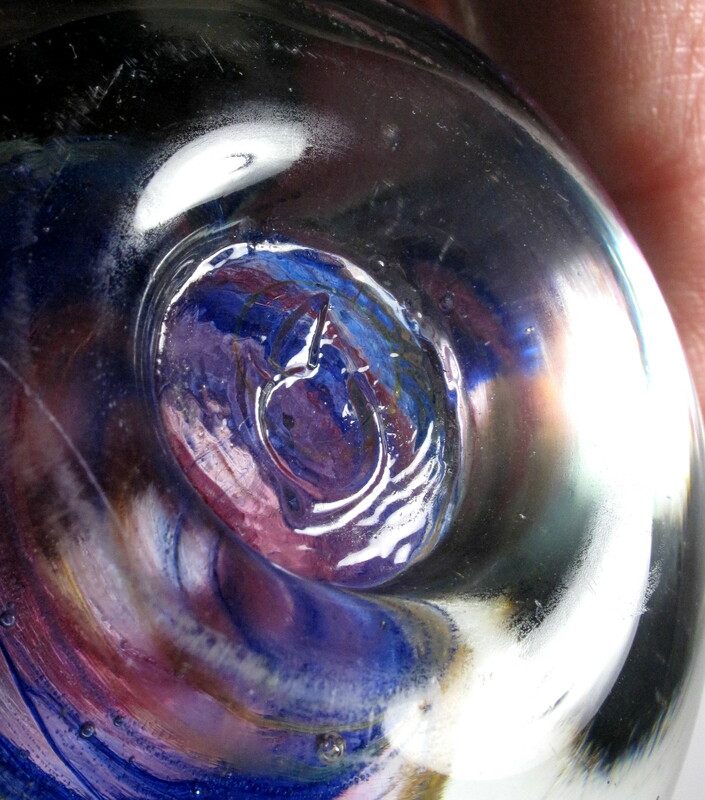 When the maker can not be identified, it is best to call them Whitefriars type or even just Old English paperweights. 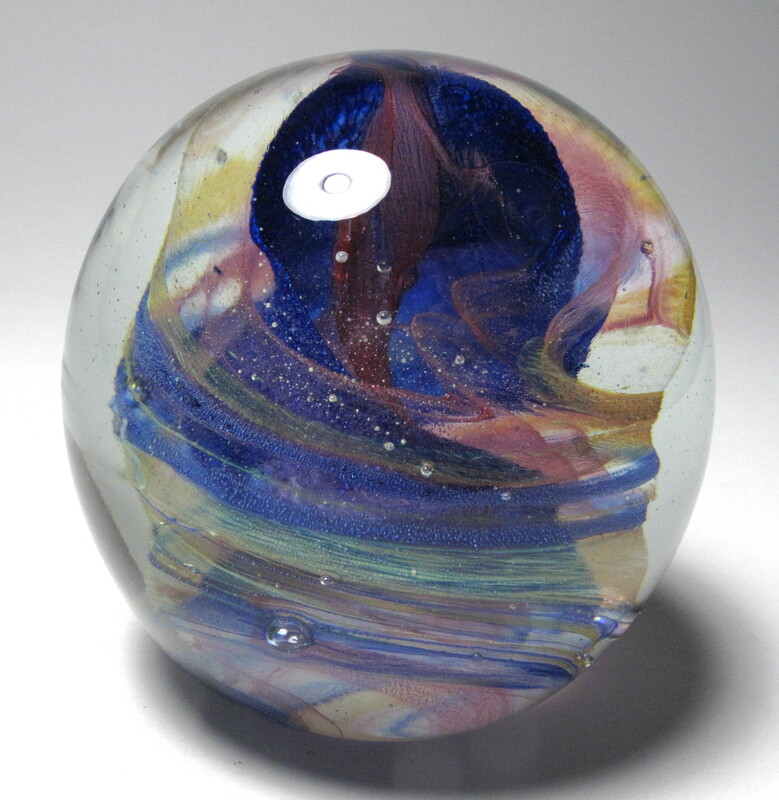 Modern Whitefriars paperweights are prized by collectors for their high quality glass and millefiori designs. 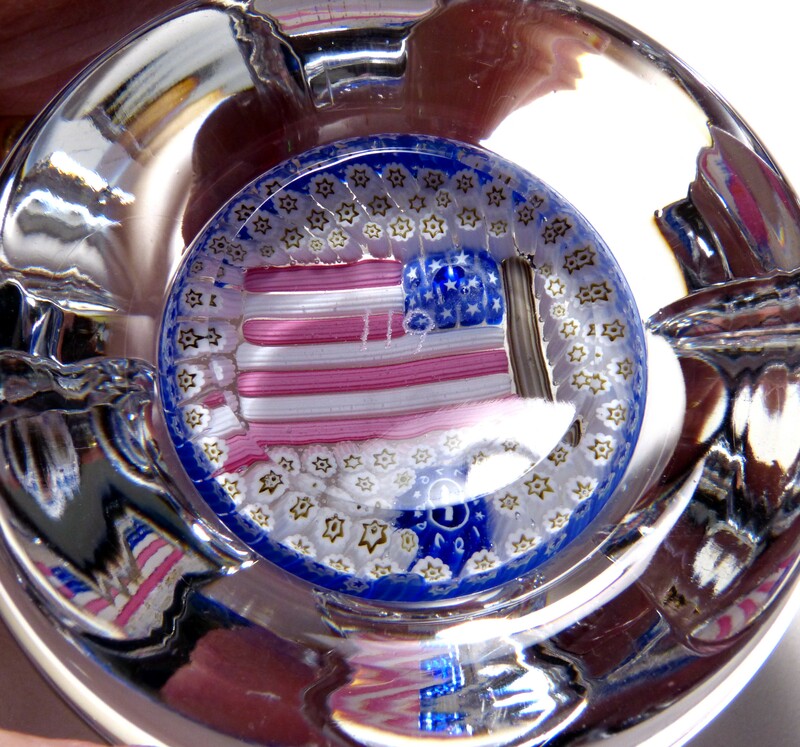 The limited edition paperweights with mosaic canes are especially sought. 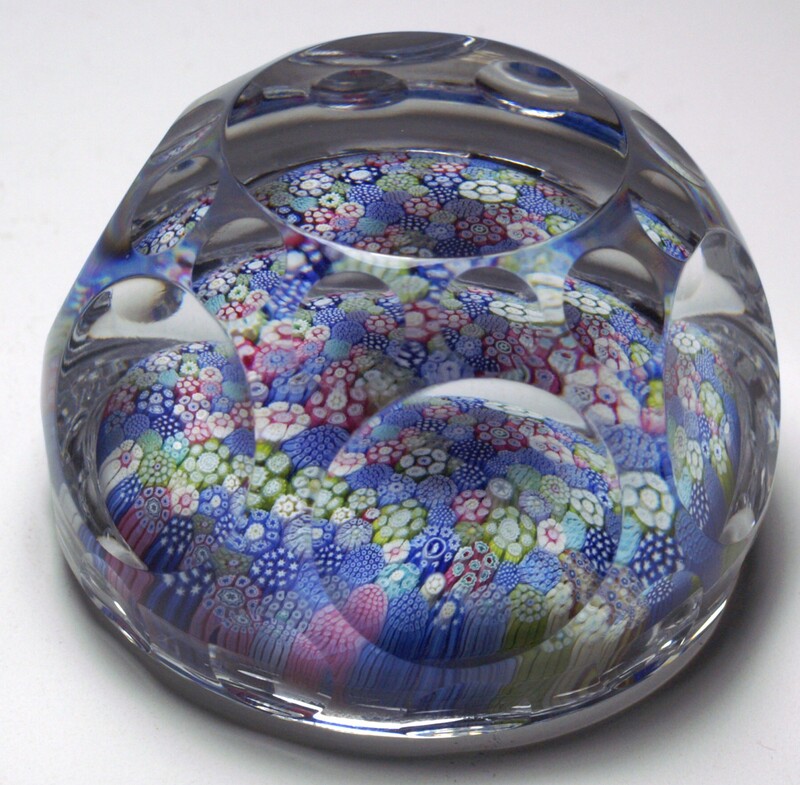 In addition to the millefiori paperweights discussed above, there is another category of collectible English paperweights. 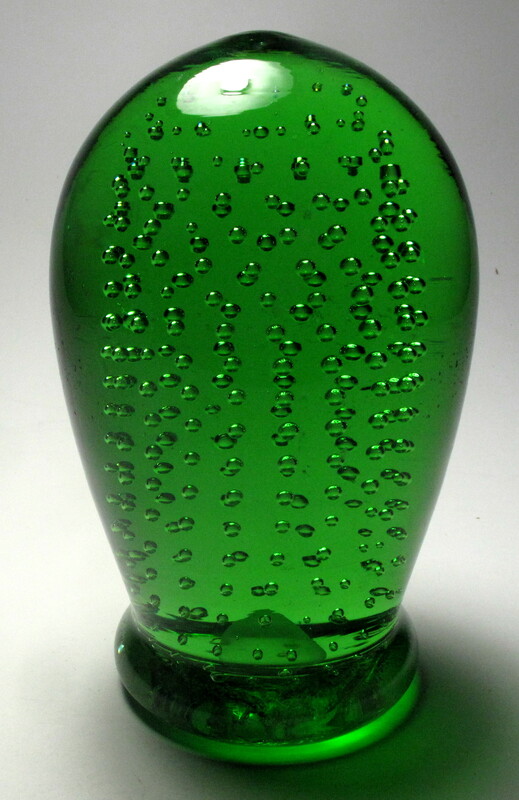 Green glass paperweights, mantle ornaments and doorstops originated as early as 1820 and continued to be made as late as 1914. 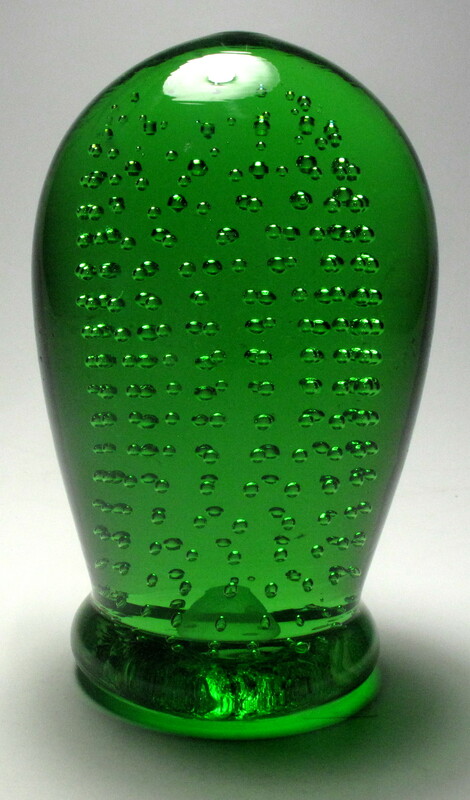 They are made from green and blue bottle glass in factories founded by John Kilner of Wakefield and other bottle makers in the Midlands and Northern regions. There are articles on this topic in 2002, 2003 and 2005 annual bulletins of the Paperweight Collectors Association. You can also read about them in Hall's Old English Paperweights by Robert Hall. Often referred to as green dumps, the most desirable are those with well executed floral designs, sulphide inclusions, or colored flowers. Even more desirable is a signed example. 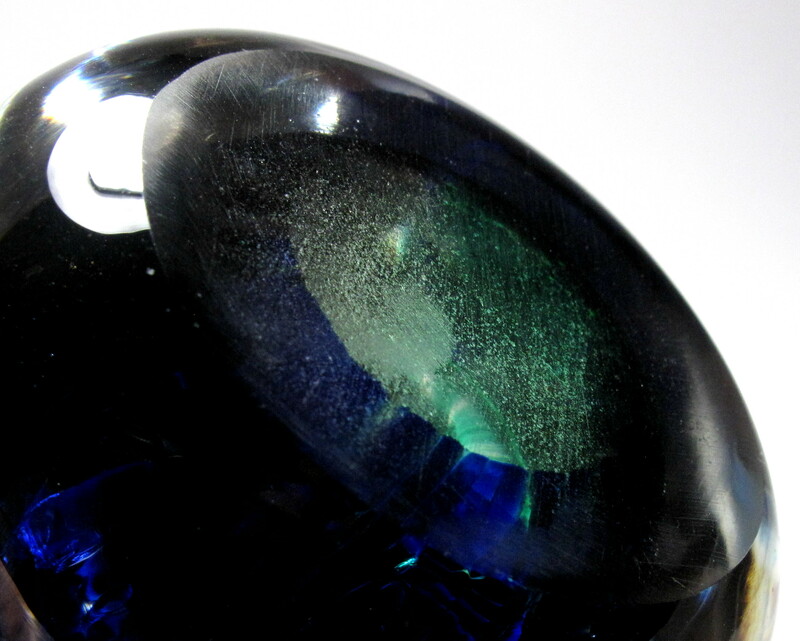 Since they are made form bottle glass, these paperweights often show signs of rough handling with chips or internal fractures. 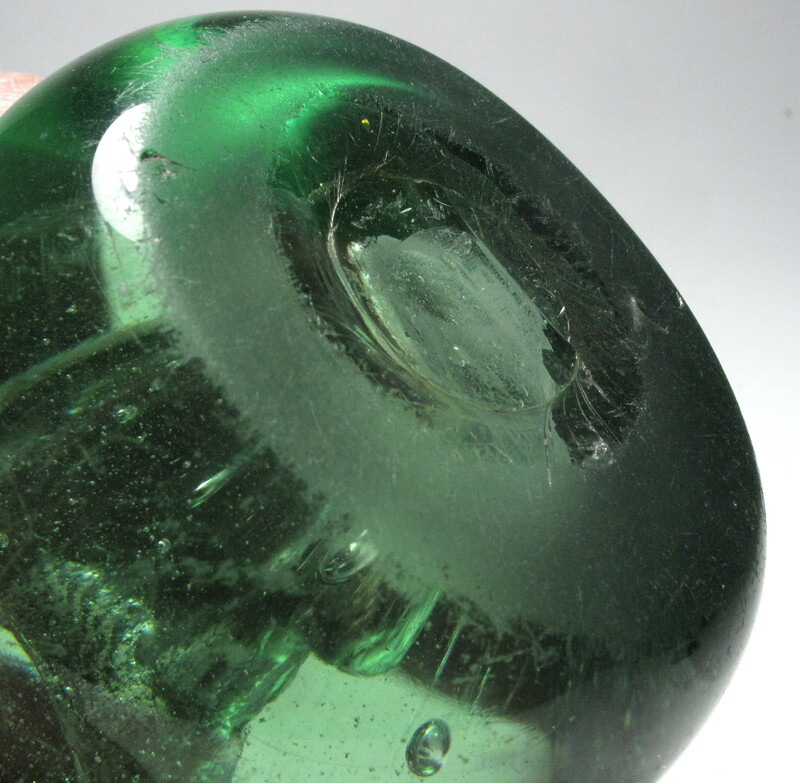 2280 Magnum Antique English Green Glass Bubble Dump Paperweight with Footed Base. circa 1890-1920. Interesting antique English bubble dump paperweight with a footed base. The controlled bubble arrangement leads me to believe this is later than other bubble dumps as it was created using a mold with a selected pattern of spikes. It is in excellent condition for its age with only a few minor scratches. Heavy wear on the base. A small dimple on the top. 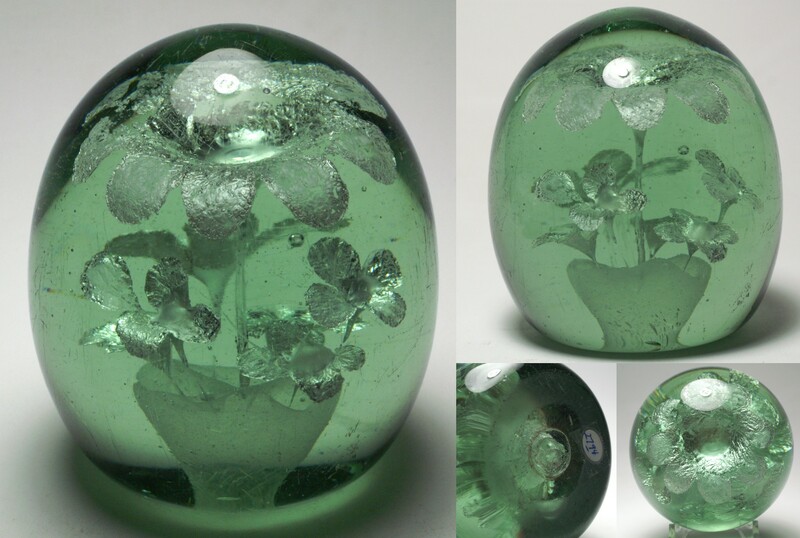 Green glass paperweights, mantle ornaments and doorstops originated as early as 1820 and continued to be made as late as 1914. Often referred to as dumps, they are made from green and blue bottle glass in factories founded by John Kilner of Wakefield and other bottle makers in the Midlands and Northern regions of England. There are articles on this topic in 2002, 2003 and 2005 annual bulletins of the Paperweight Collectors Association. You can also read about them in Old English Paperweights by Robert Hall. These dumps can be found with internal bubble designs, well executed floral designs, sulphide inclusions, or colored flowers. Signed examples exist and command a premium price. 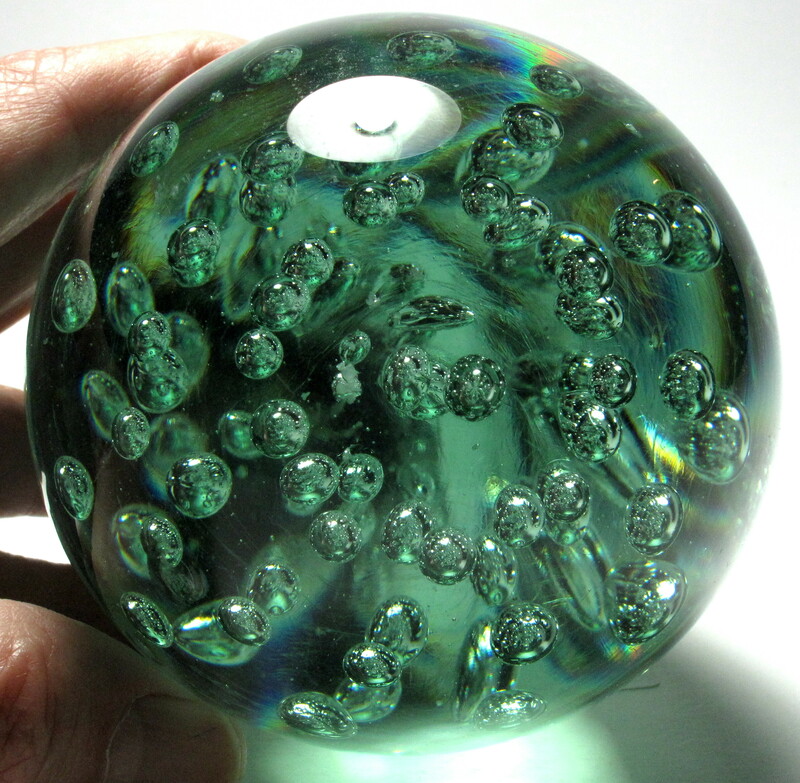 Since they are made from bottle glass, these paperweights often show signs of rough handling with chips or internal fractures. Very Large Size: Just under 3 1/4" diameter by 5 5/16" tall. Condition: It is in excellent condition for its age with only a few minor scratches. Heavy wear on the base. Signature: Unsigned, but I guarantee this is an antique English paperweight. $185 postage paid in the US. 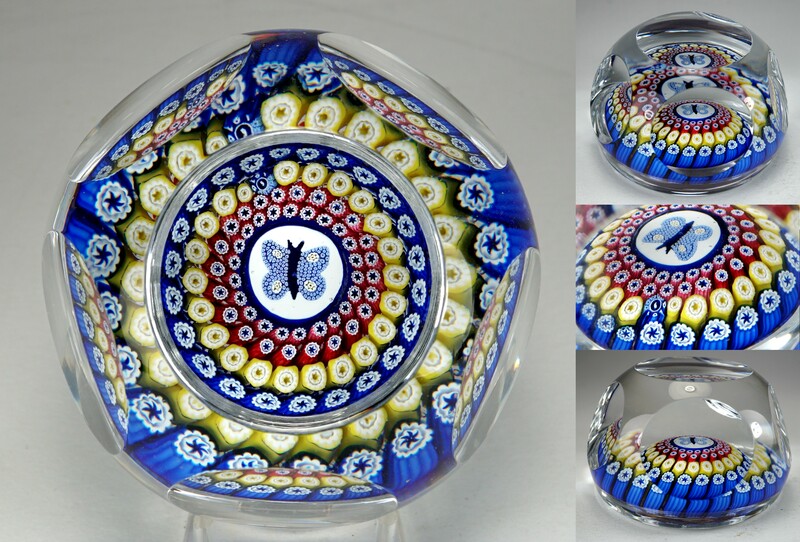 4908 Magnum Whitefriars 1976 Concentric Millefiori Butterfly Paperweight. dated 1976. 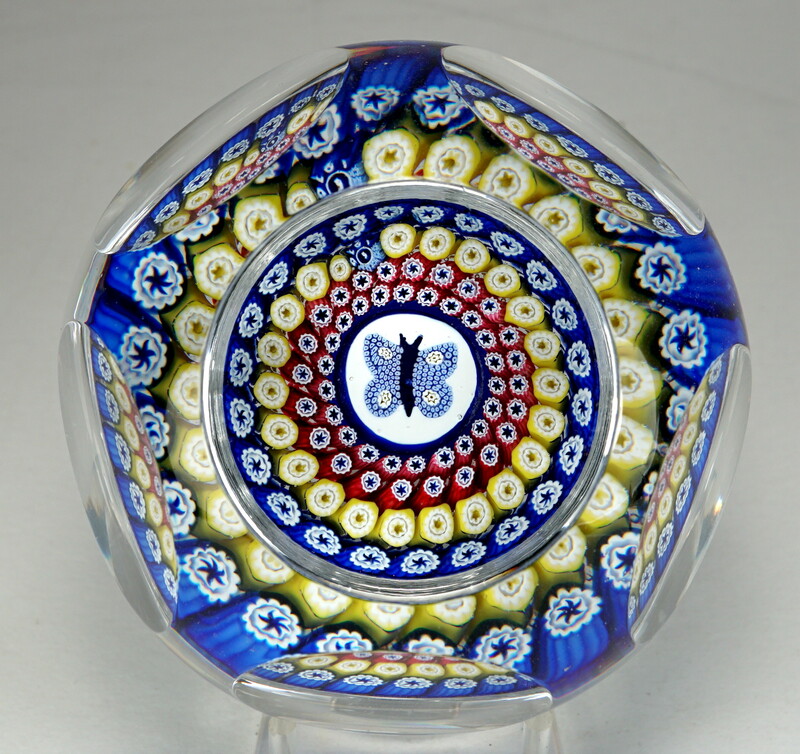 This hard to find concentric millefiori butterfly paperweight features a wonderful millefiori mosaic of a butterfly in the center of a four row millefiori concentric pattern. 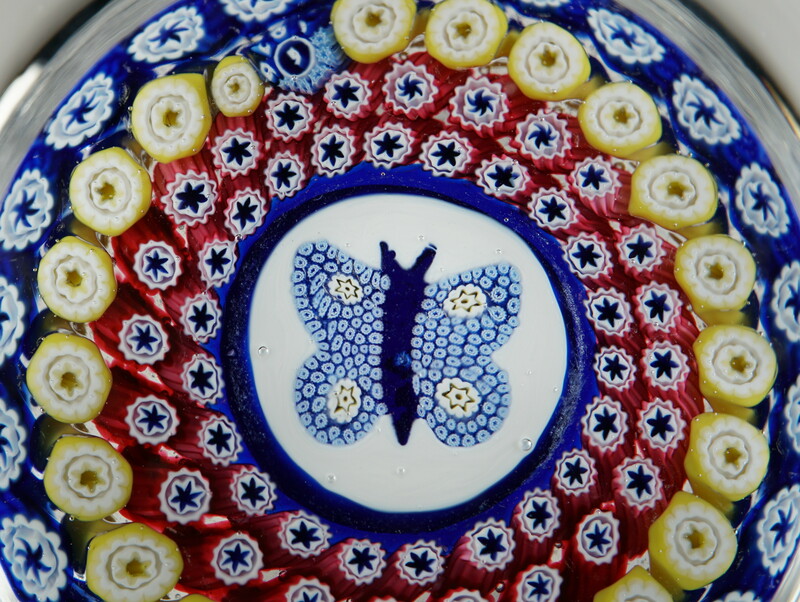 The butterfly mosaic is set on a white background with a blue surround. There are two rows of red canes, then a yellow row, and a blue outer row. The Whitefriars signature cane with a white monk and the year 1976 is in the yellow row, just above the butterfly. Faceted with one top facet and five side facets. 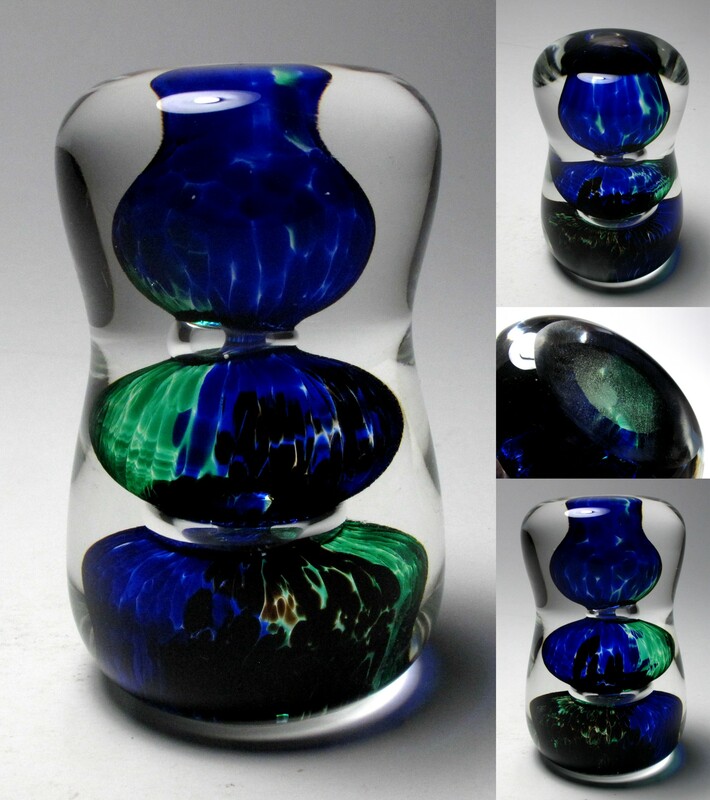 A desirable Whitefriars paperweight with great color. 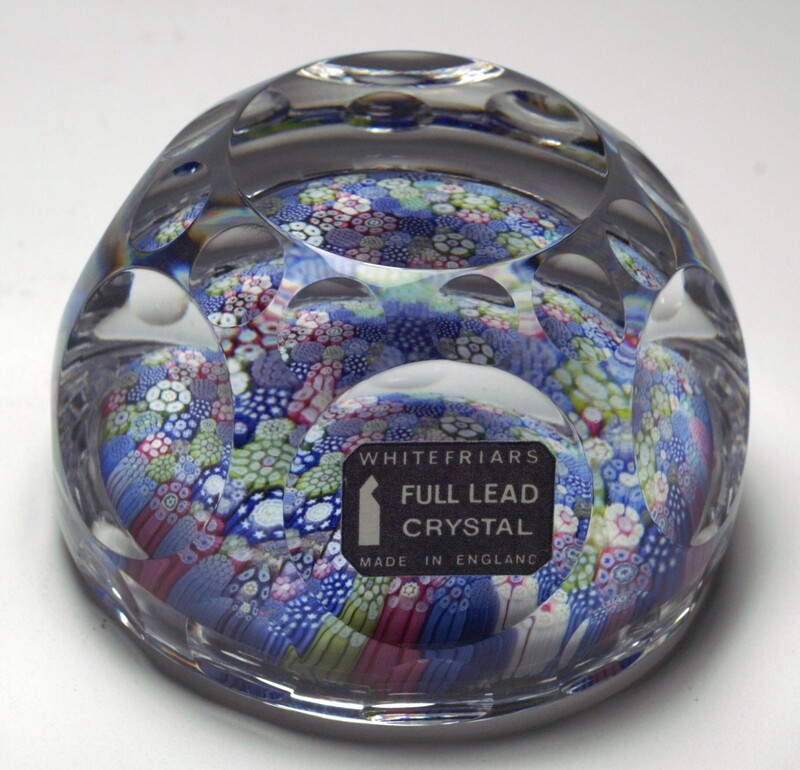 Modern Whitefriars paperweights are prized by collectors for their high quality glass and millefiori designs. The paperweights with mosaic canes are especially sought after. The name Whitefriars Glass dates from sometime in the 1600s. The original site had been occupied by a community of Carmelite monks known as White Friars, hence the name taken by the glass company. Some sources state that at least a portion of the company operated under the name of James Powell and Sons from 1834 to 1962. Other sources state that the Whitefriars name was used from 1680 to 1980. Limited production of millefiori paperweights and other millefiori items started some time in the 1930s and first appeared in the 1938 catalog. Millefiori items were made using English full lead crystal (33% lead oxide). It is difficult to associate specific paperweights with this production. 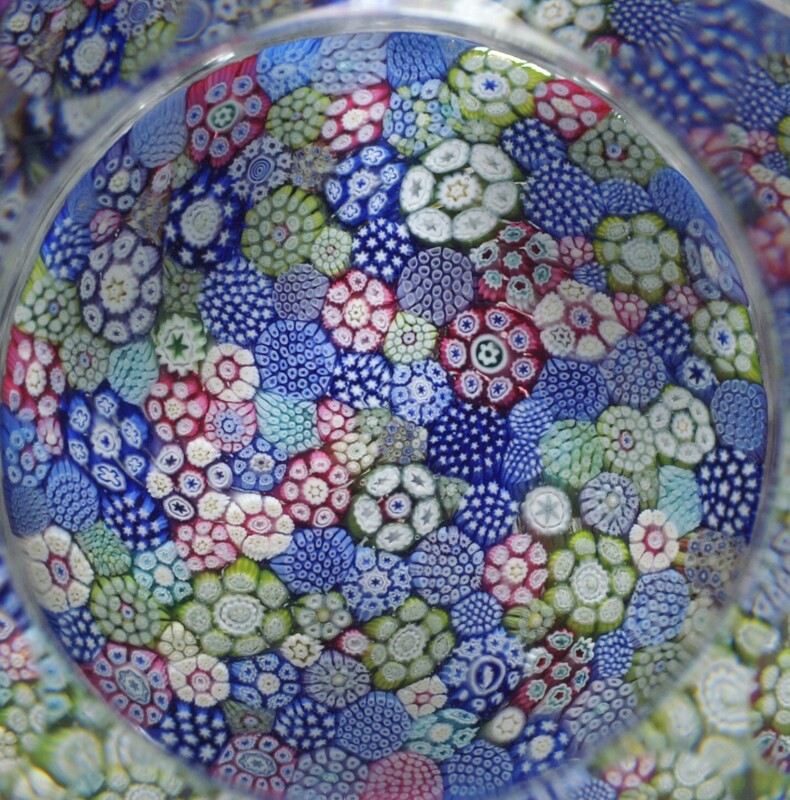 After 1945, they made colored glass and bubble design paperweights until the modern millefiori production started about 1951. Even then relatively few designs were produced until the 1970s. In 1980, Whitefriars glass went out of business. 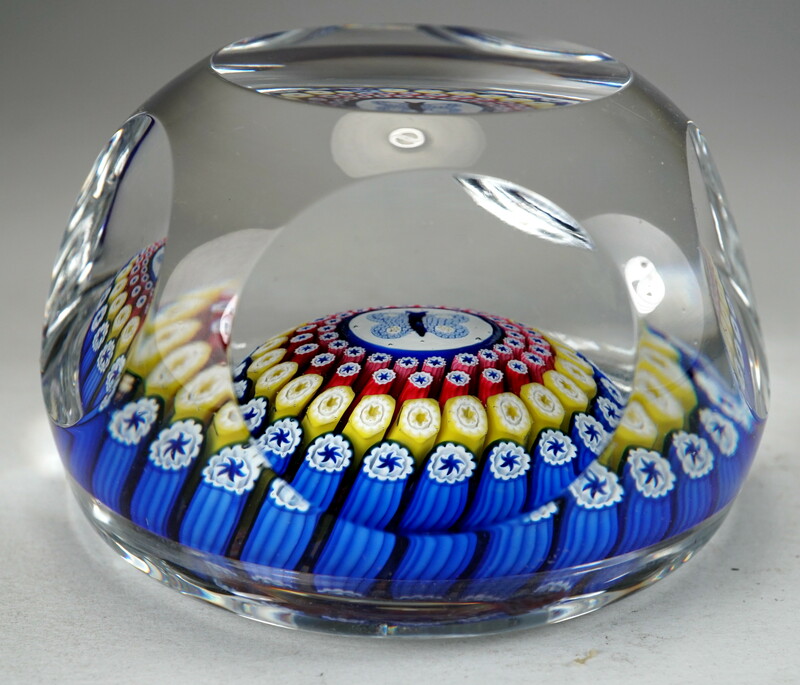 After Whitefriars Glass was liquidated, Caithness Glass purchased the rights to the name and produced paperweights under the Whitefriars name for awhile. For a long time, collectors believed that English paperweights and inkwells dated 1848 and similar undated items were made by Whitefriars. The dates, however, are false dates and have been traced to production at Arculus and Walsh-Walsh in the 1920s and 1930s. 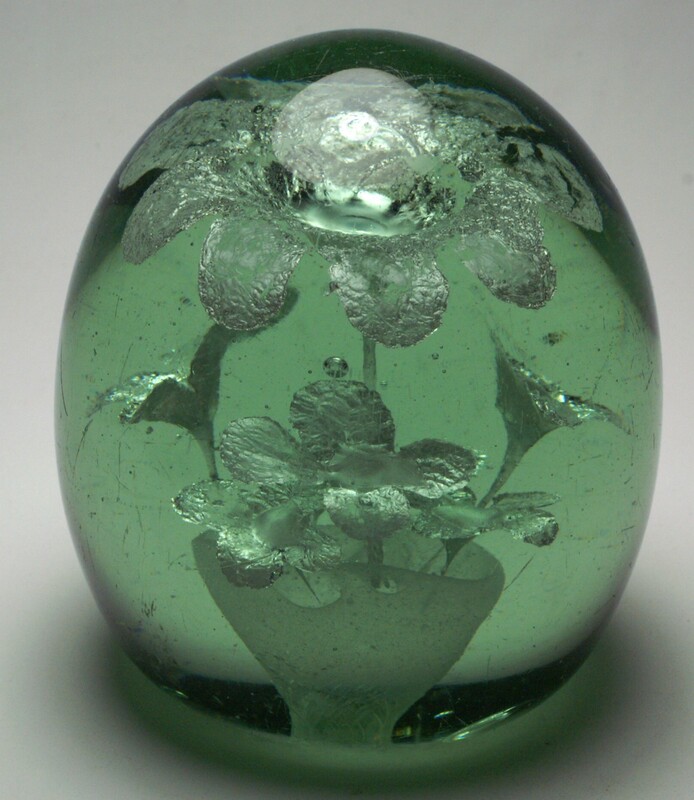 Most paperweights referred to as old Whitefriars or antique Whitefriars were, in fact, made by other factories such as Richardson, Arculus, Walsh-Walsh,or one of the unidentified Old English factories. When the maker can not be identified, it is best to call them Old English paperweights and not associate them with Whitefriars. Very Large Size: Just over 3 3/16" diameter by 1 7/8" high. The base is ground concave. Faceted with one top facet and five side facets. Condition: Outstanding condition. No chips, cracks or scratches. Signature: Signed in the design with a Whitefriars 1976 signature / date cane in the yellow row. 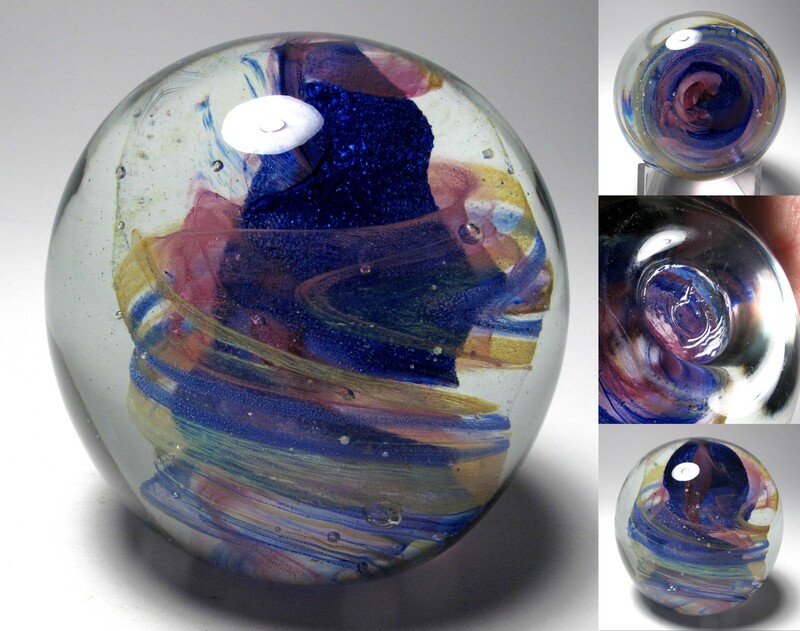 4686 Magnum Colorful Michael Harris (Isle of Wight Studio Glass) Swirl Paperweight. circa mid 1970s. 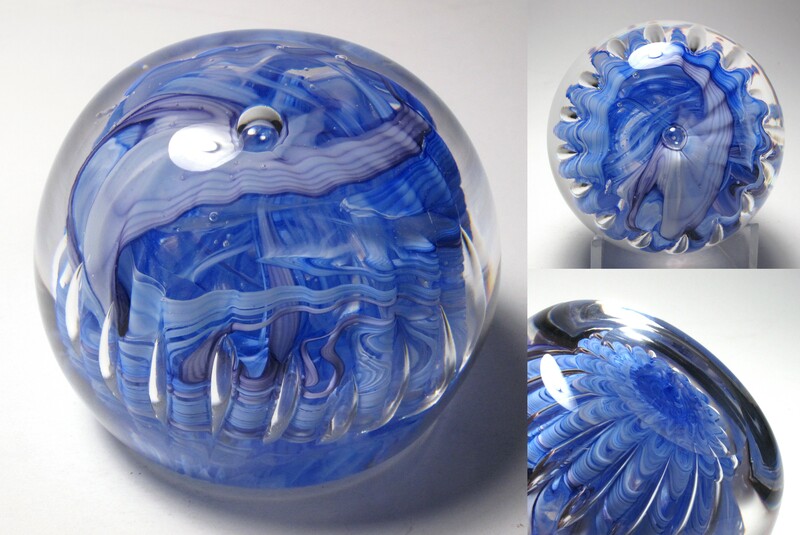 Wonderful swirl paperweight made by Michael Harris at the Isle of Wight Studio Glass. 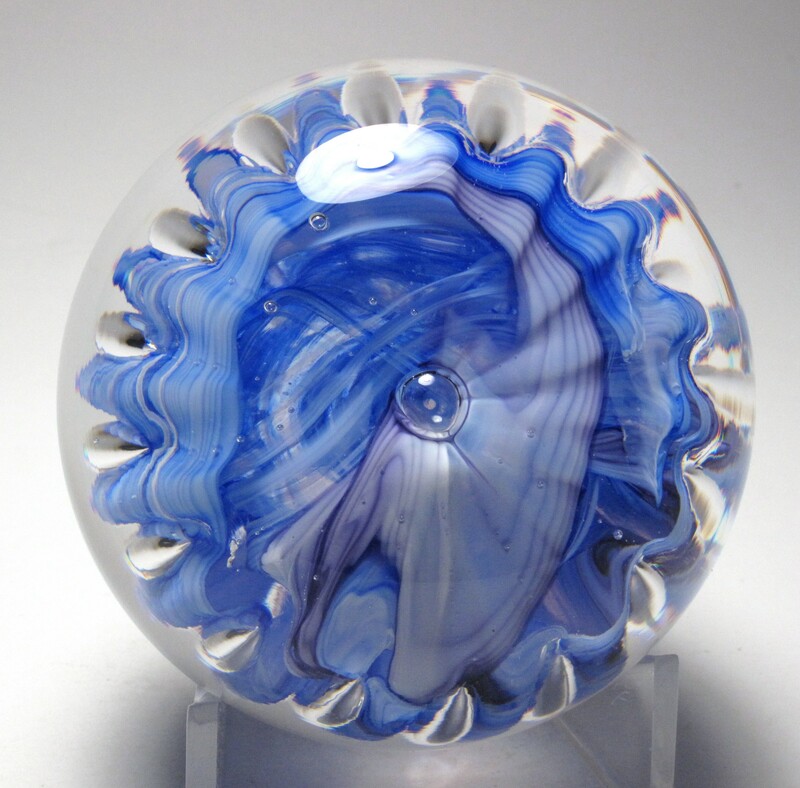 Swirls of multiple colors surround a brilliant blue core. It is signed on the base with the left hand flame pontil mark. Note 1: According to the enthusiast and collector wikidot website IOW Studio Glass, the flame pontil mark with the flame part on the left hand side was used by Isle of Wight Studio Glass, Kerry Glass, and St. John's Glass (Isle of Man). The wikidot website is not officially connected to the Isle of Wight company. It is also possible that others have used this mark (Allan Port’s comment). This makes a firm attribution difficult. Note 2: Ron Wheeler of Artius Glass, an expert in Isle of Wight glass, provided the attribution that this paperweight was almost certainly made by Michael Harris at Isle of Wight Studio Glass during the mid 1970s. Ron Wheeler also stated that the colors are typical of the random swirl colors used by Michael Harris. Isle of Wight Studio Glass was established in 1973 by one of the founders of the British Studio Glass Movement, Michael Harris (1933 – 1994). Michael graduated from the Royal College of Art in 1959 and later became an RCA tutor, setting up hot glass facilities there in 1967. 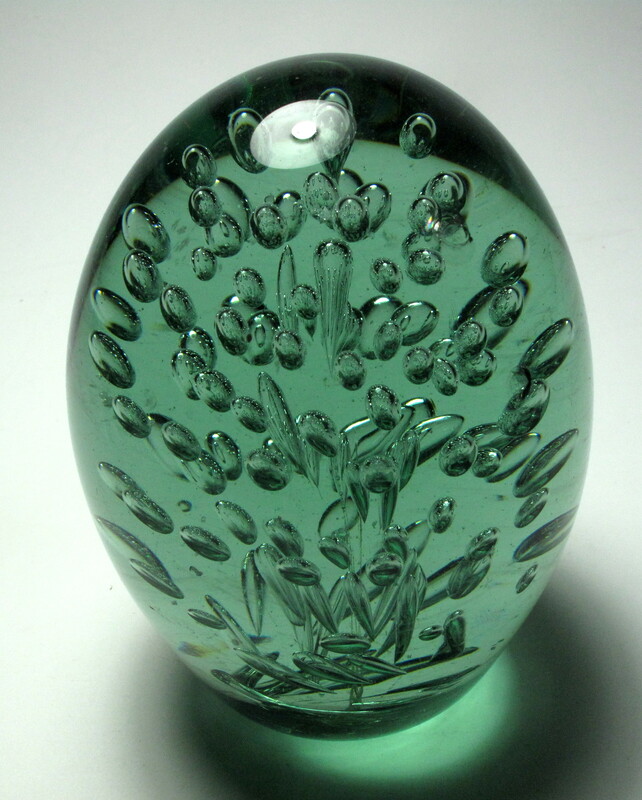 The following year he founded Mdina Glass in Malta, remaining there until 1972, when he moved back to the UK. In 1973, with his wife Elizabeth, he founded Isle Of Wight Studio Glass, in Old Park, St Lawrence where it continued until his premature death in 1994. The glass studio continued to operate under the guidance of his son Timothy Harris until 2012. In 2014, the studio was re-established in a new location in the Arreton Barnes Craft Village, near Newport on the Isle of Wight with assistance from Michael's brother Richard Harris and Ron and Ann Wheeler of Artius Glass. Timothy Harris and his mother Elizabeth continue to operate the studio. Another son of Michael and Elizabeth Harris, Jonathan Harris established Jonathan Harris Glass in Ironbridge, Shropshire in 1999. Very Large Size: 3 1/4" diameter and just under 3 1/4" high. The bottom is fire finished with a left hand flame pontil mark. Condition: Excellent condition with only minor wear to the base. No damage found on inspection. Signature: Signed with the left hand flame mark used at the Isle of Wight. 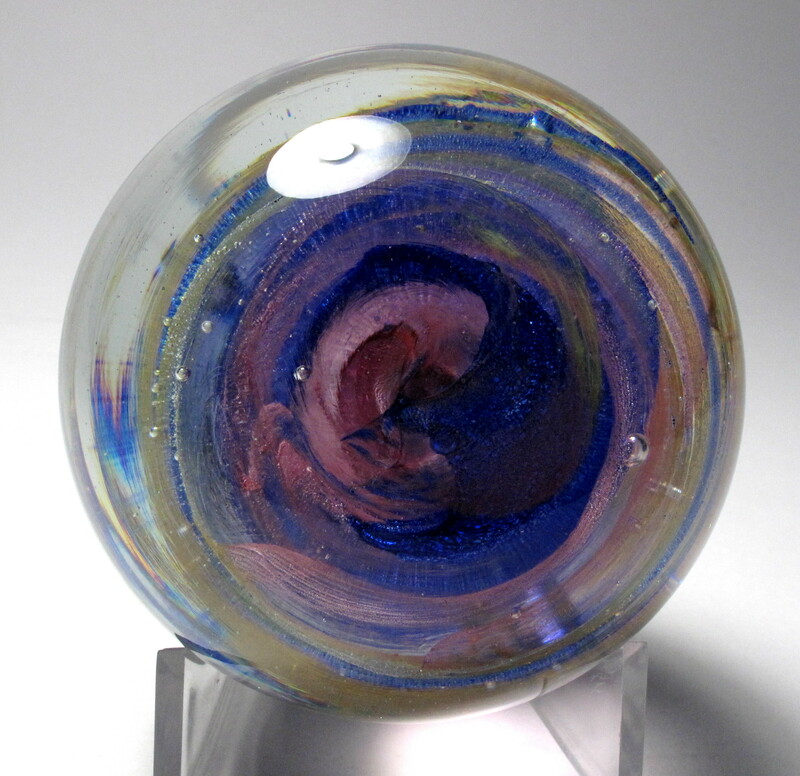 Based on the colors and flame mark, this paperweight was almost certainly made by Michael Harris at Isle of Wight Studio Glass during the mid 1970s. 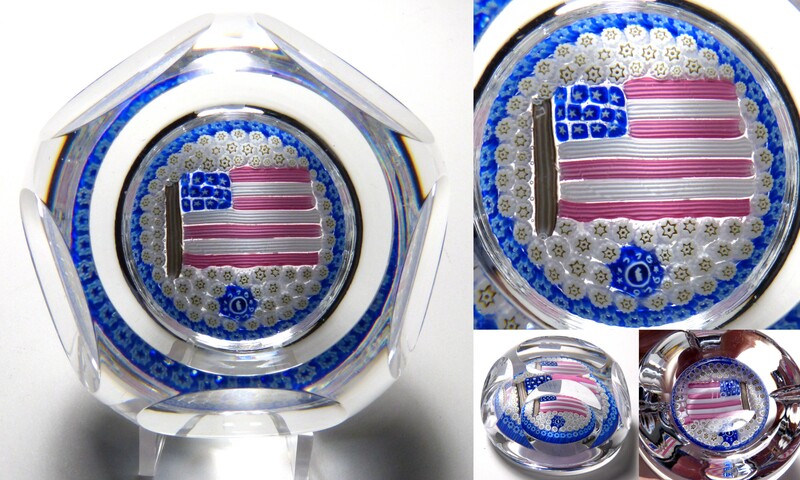 4410 Rare Magnum Whitefriars 1976 Bicentennial Millefiori Flag Limited Edition Paperweight. circa 1976. 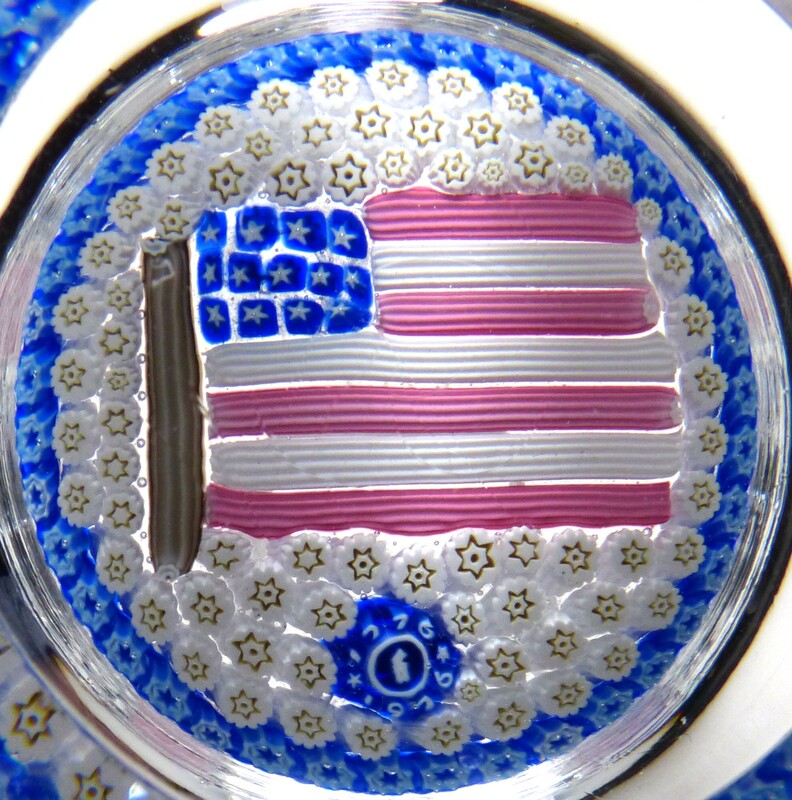 This is a hard to find Whitefriars Bicentennial Paperweight featuring a millefiori mosaic of the American Flag. There are thirteen blue and white canes for stars and four red and three white canes for the stripes. A gold cane makes provides a staff . In the background there is a white and gold carpet ground of millefiori canes and also a millefiori garland of blue and white canes on the outside. This weight is numbered 119. There is a special Whitefriars signature cane with a white monk and the years 1776 and 1976. 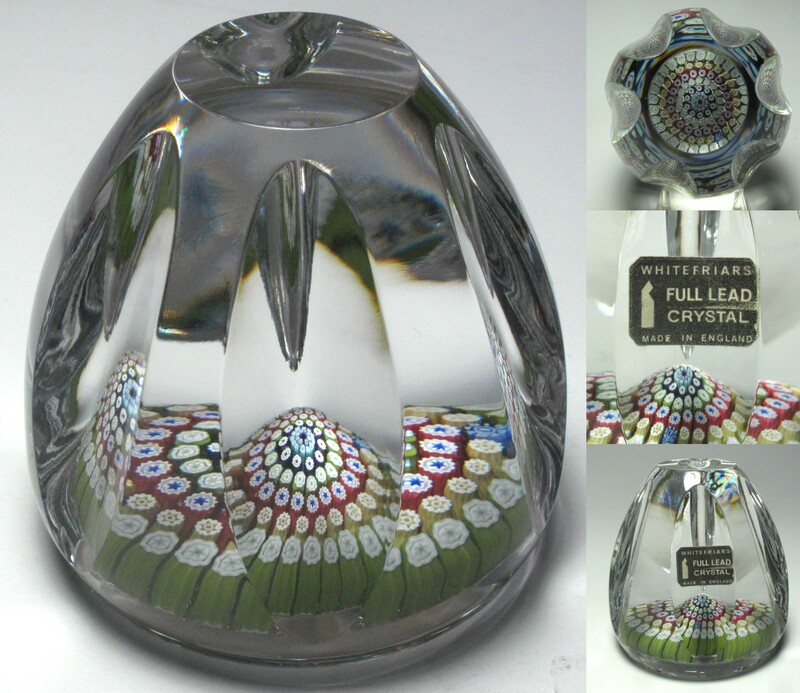 The paperweight is made using full lead crystal which gives it a brilliant finish. It is faceted with a top facet and five side facets. 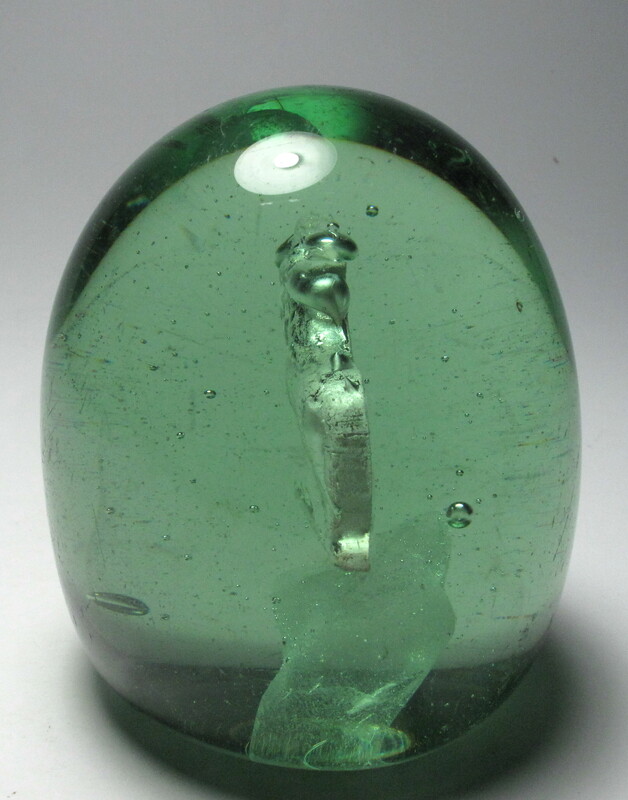 This is an especially rare Whitefriars paperweight. 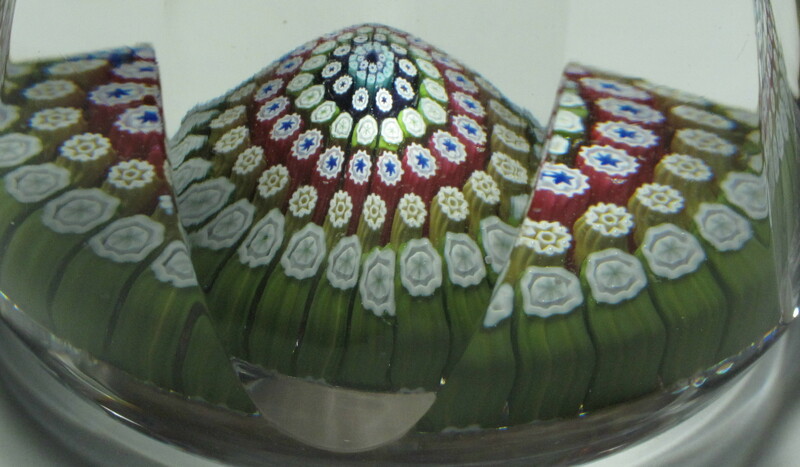 Although the edition size was planned for 1,000 paperweights, very few were made due to the complexity of the design made setup and pickup very difficult. Some estimates are that as few as 150 were actually made. It was made for sale in the US only. 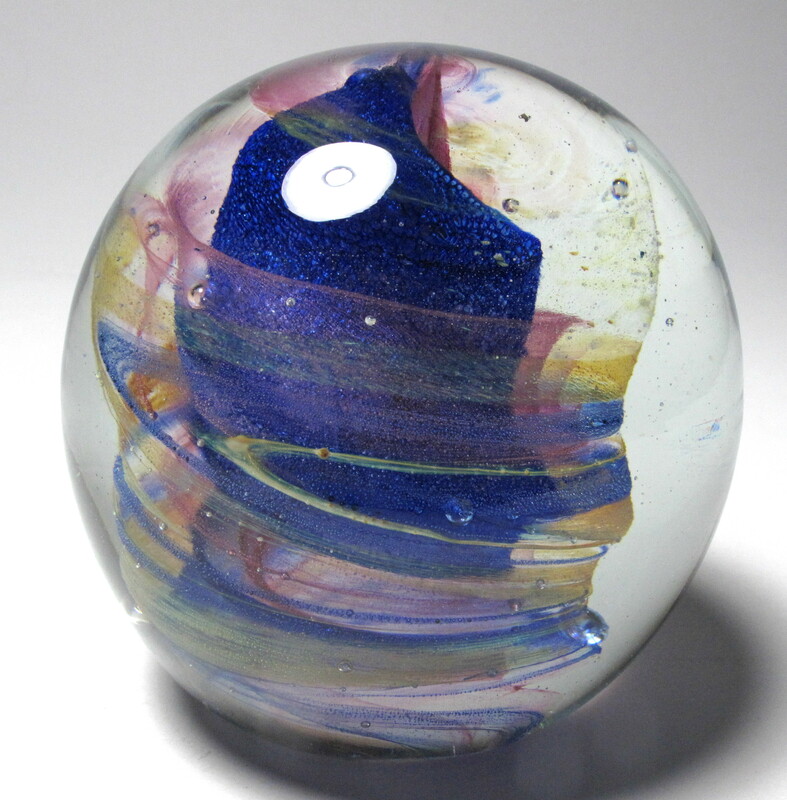 Modern Whitefriars paperweights are prized by collectors for their high quality glass and millefiori designs. 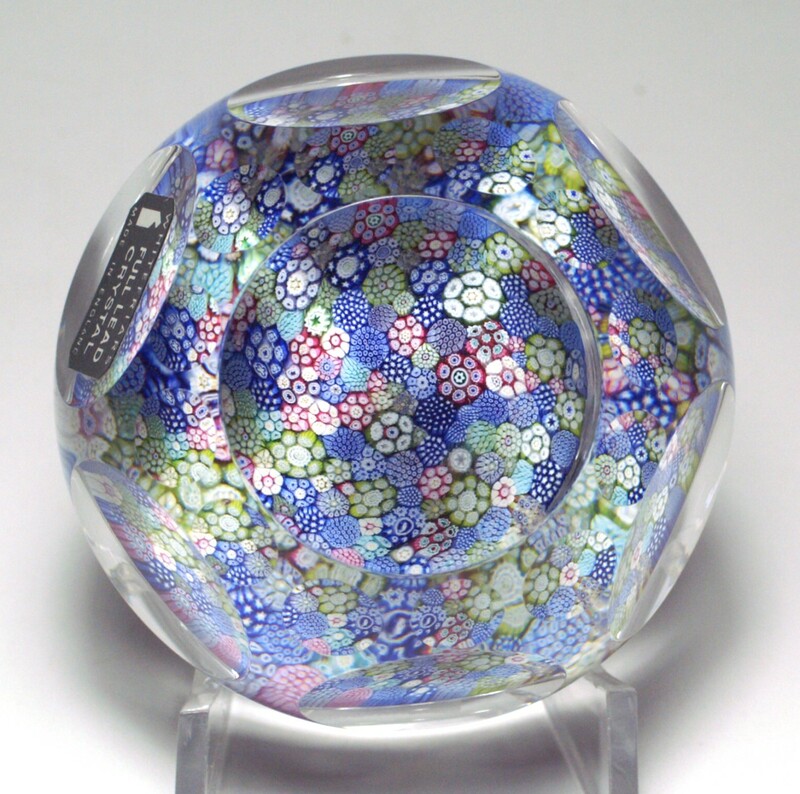 The limited edition paperweights with mosaic canes are especially sought after. The name Whitefriars Glass dates from sometime in the 1600s. The original site had been occupied by a community of Carmelite monks known as White Friars, hence the name taken by the glass company. Some sources state that at least a portion of the company operated under the name of James Powell and Sons from 1834 to 1962. Other sources state that the Whitefriars name was used from 1680 to 1980. 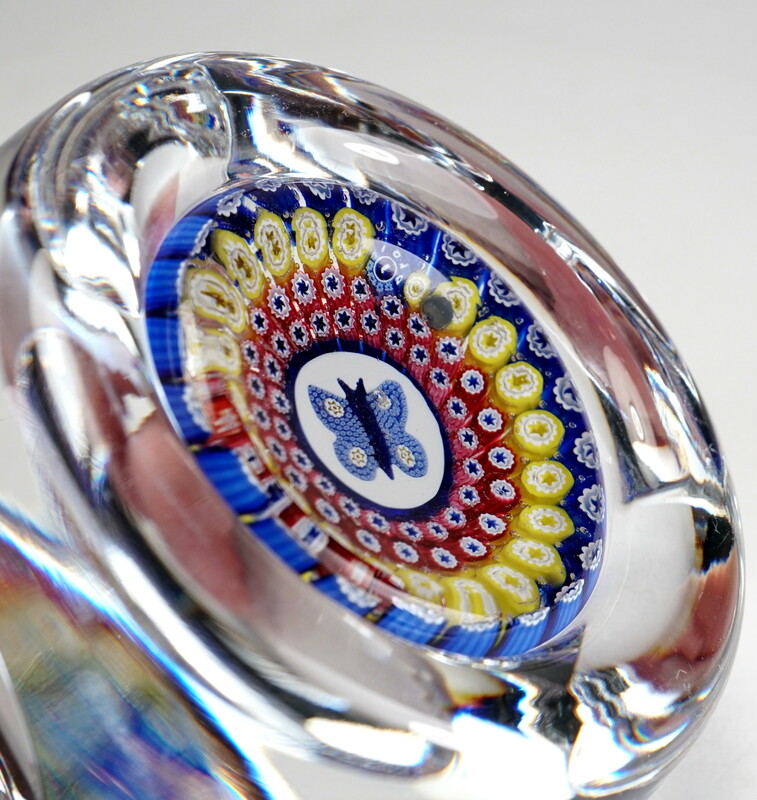 Limited production of millefiori paperweights and other millefiori items started some time in the 1930s and first appeared in the 1938 catalog. Millefiori items were made using English full lead crystal (33% lead oxide). It is difficult to associate specific paperweights with this production. After 1945, they made colored glass and bubble design paperweights until the modern millefiori production started about 1951. Even then relatively few designs were produced until the 1970s. In 1980, Whitefriars glass went out of business. 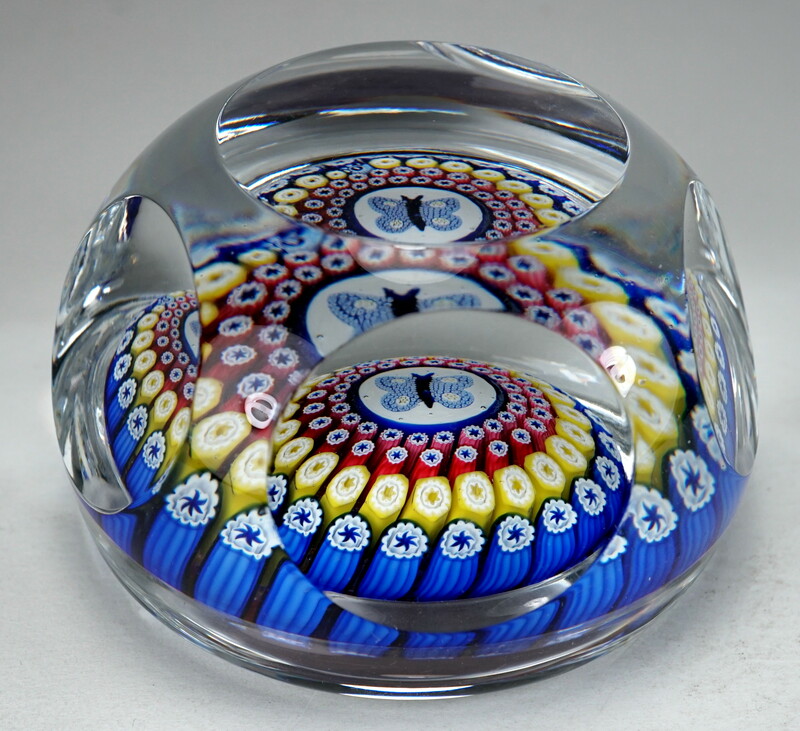 After Whitefriars Glass was liquidated, Caithness Glass purchased the rights to the name and produced paperweights under the Whitefriars name for a while. For a long time, collectors believed that English paperweights and inkwells dated 1848 and similar undated items were made by Whitefriars. The dates, however, are false dates and have been traced to production at Arculus and Walsh-Walsh in the 1920s and 1930s. 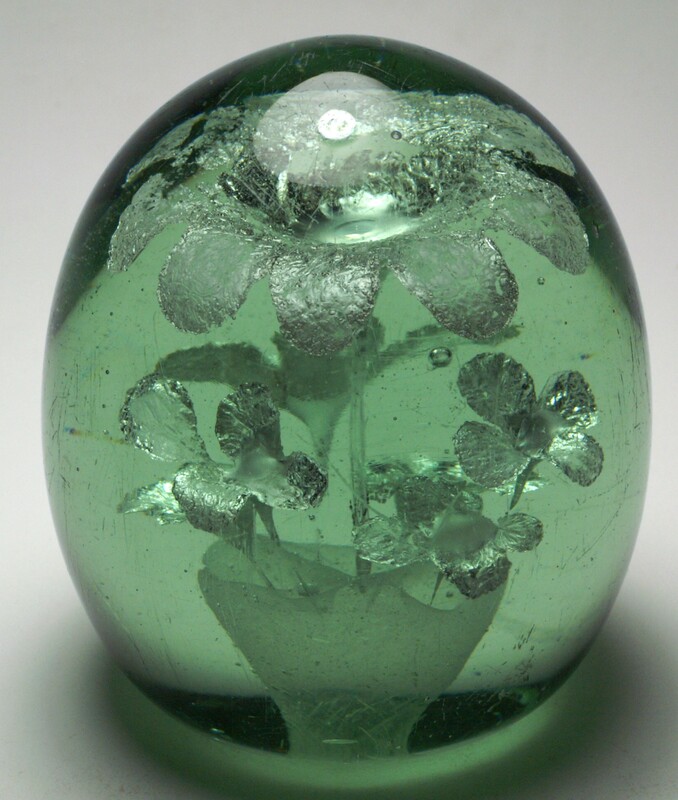 Most paperweights referred to as old Whitefriars or antique Whitefriars were, in fact, made by other factories such as Richardson, Arculus, Walsh-Walsh, or one of the unidentified Old English factories. When the maker can not be identified, it is best to call them Old English paperweights and not associate them with Whitefriars. Size: 3 1/8 diameter by 1 3/4" high. The base is ground concave. Faceted with one top facet and five side facets. 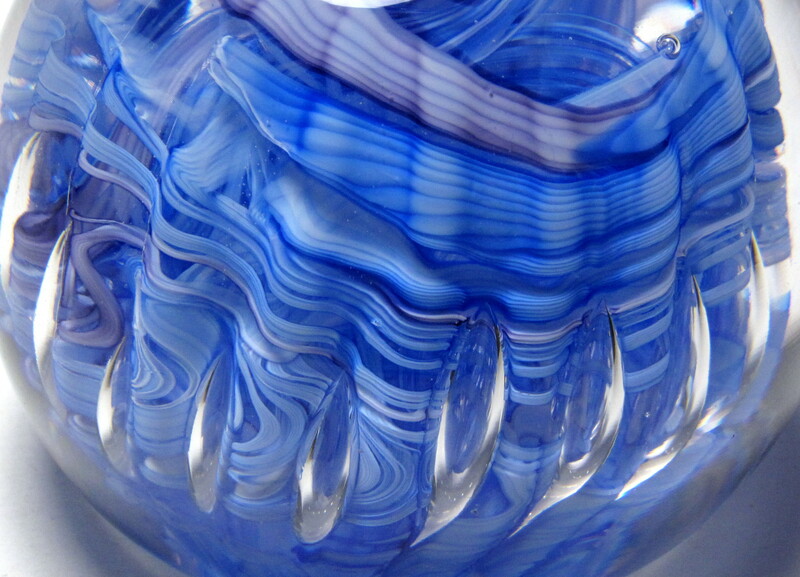 Signature: Signed in the design with a special Whitefriars signature cane. The signature cane has a white monk and the dates 1776 and 1976 cane. Numbered on the bottom with the number 119. 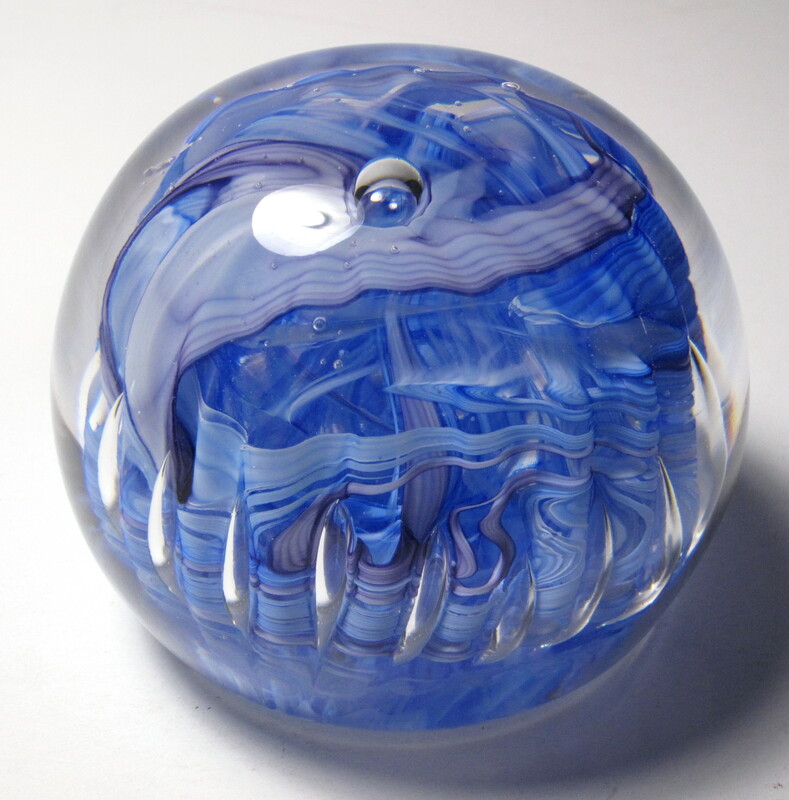 3522 Graceful Liam Carey (Liskeard or Merlin Glass) Swirl Paperweight from Cornwall, England. circa 1977 - 1994. 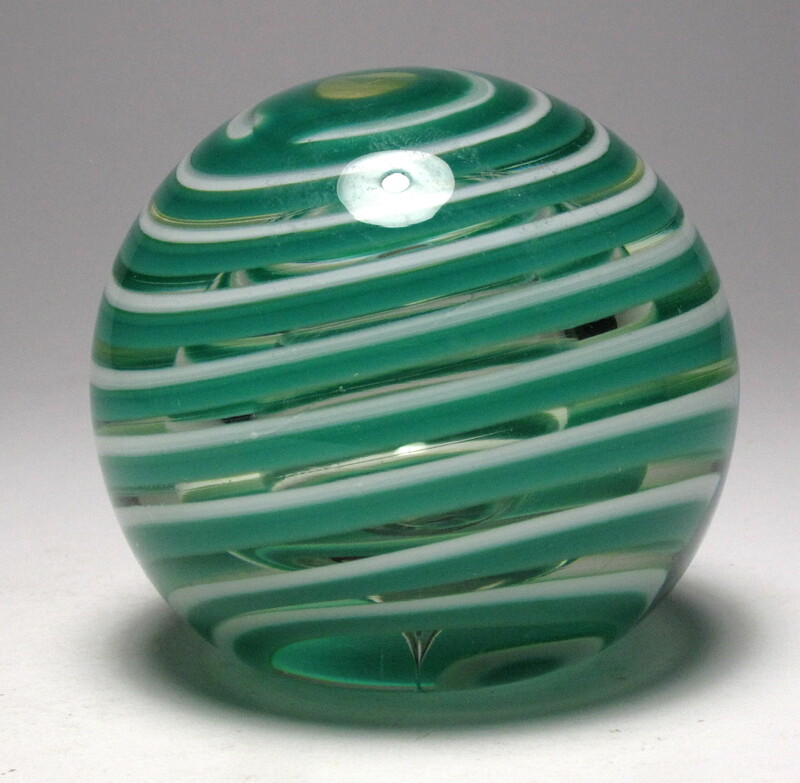 This paperweight features a green and white swirl wrapping around the paperweight from the top to the bottom. It is signed with a label on the base "HANDMADE GLASS BY Liam Carey LISKEARD 42399". I believe this was made at Liskeard Glass before Liam Carey bought the firm and renamed it Merlin Glass. See below for a brief history. An interesting addition to any collection of English paperweights. 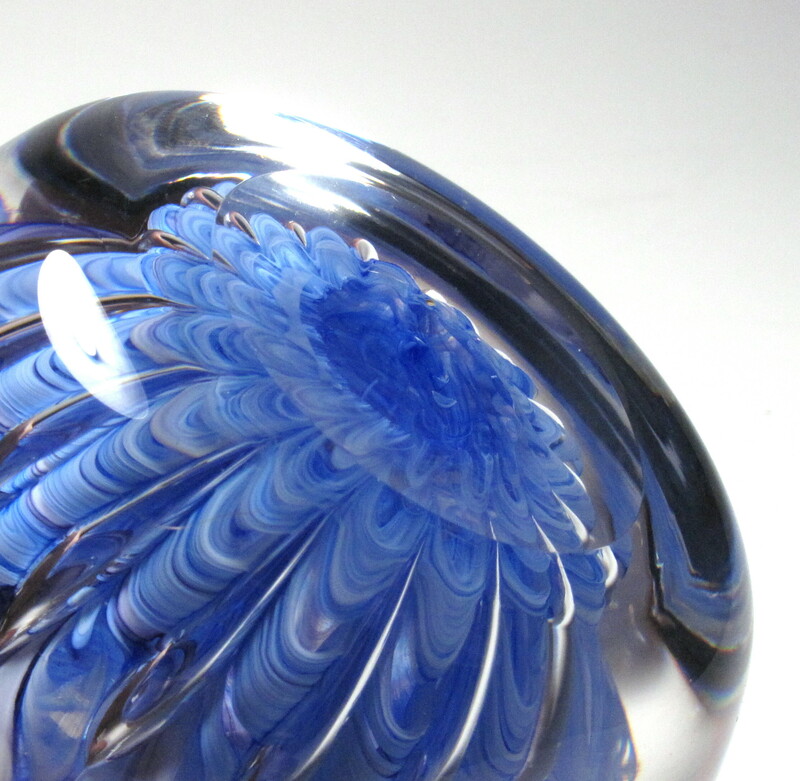 Liskeard Glassworks was established by John Randle in 1970 in Liskeard, Cornwall, England. It claims to be one of the first glass studios established outside of London. The workers were Jim Dyer, Bill Robson (ex-Whitefriars workers) and Duncan Randle. Originally they were best known for fine wine glasses and tankards. 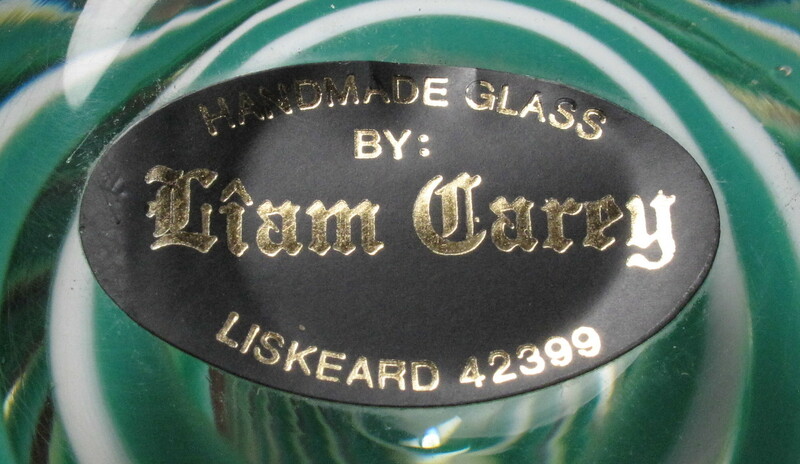 Liam Carey joined Liskeard Glass in 1977 at the age of 16 as an apprentice and made their full range. In 1983 Liam purchased Liskeard Glass and renamed it Merlin Glass and continued to make a large range of vases, bowls, wine glasses, flowers, scent bottle, paperweights. Starting in 1994, they started focusing on glass door knobs made for Laura Ashley and others and which they continue to make today. Large Size: 2 13/16" diameter by just under 2 5/8" high. The base has a label, so I was not able to determine if a pontil mark remains. 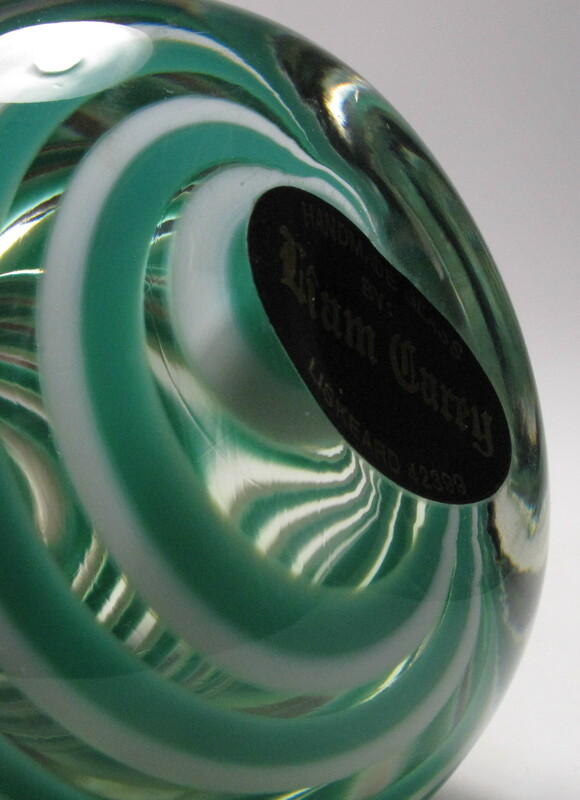 Signature: Signed with a label on the base "HANDMADE GLASS BY Liam Carey LISKEARD 42399". Condition: Excellent condition with no cracks, chips, or scratches found on inspection. 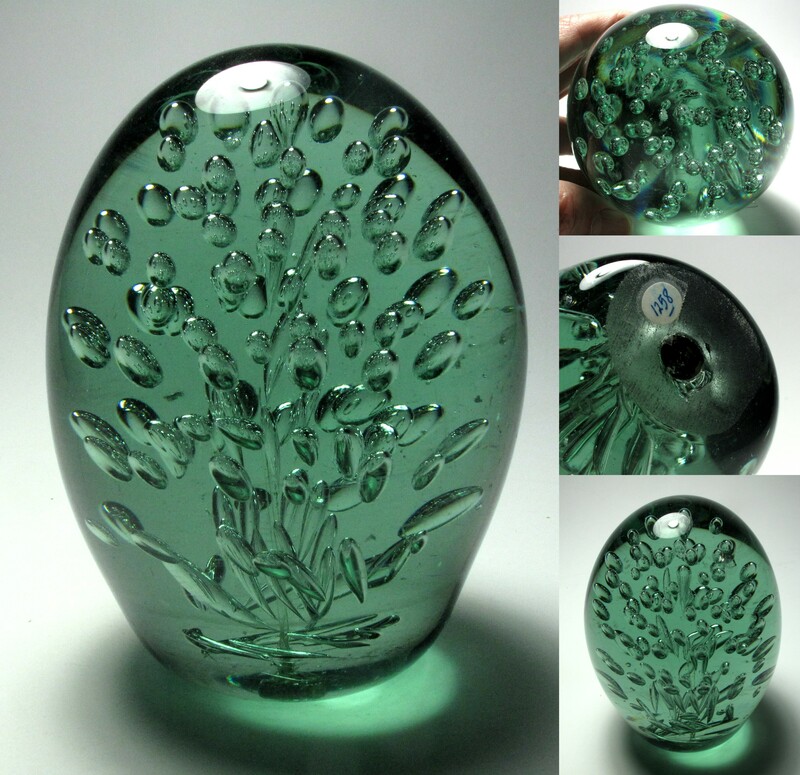 2794 Magnum Antique English Green Glass Dump Paperweight with Seven Foil Flowers. circa 1840-1860. This is an unusual example with a four level design. There is one large central flower plus two layers of smaller flowers all in a small flower pot. Possibly made by John Kilner of Wakefield, England. A very showy example. I had difficulty getting good pictures of this paperweight. Please ignore the glare from the lights. The paperweight looks a lot better than the pictures show. Large Size: 3 3/4" tall by just under 3 1/2" diameter. Condition: Very good condition. 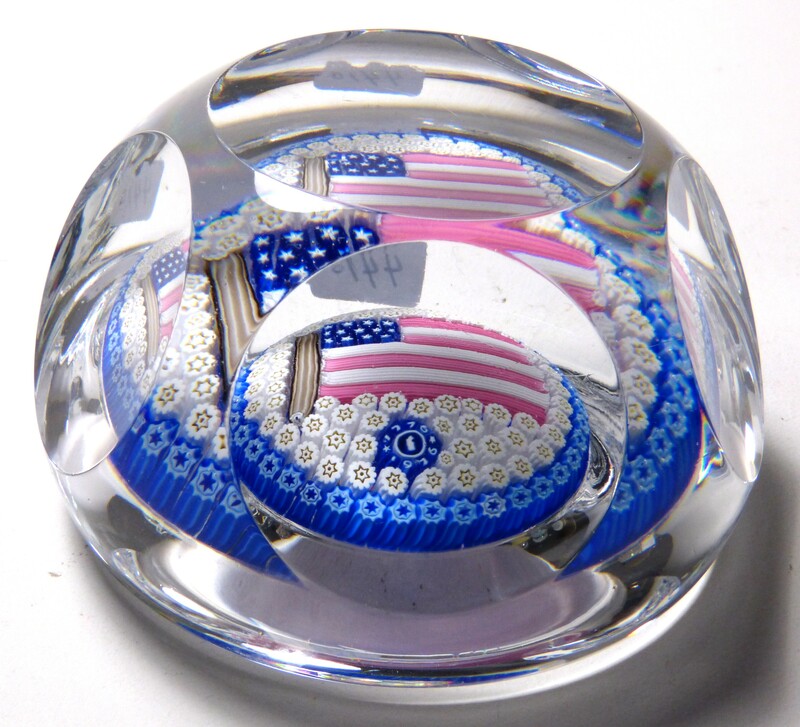 As is typical for this type of paperweight, there are scratches and abrasions on the surface, but this paperweight has no chips, cracks or impact marks. The bottom has a rough pontil and show considerable wear. 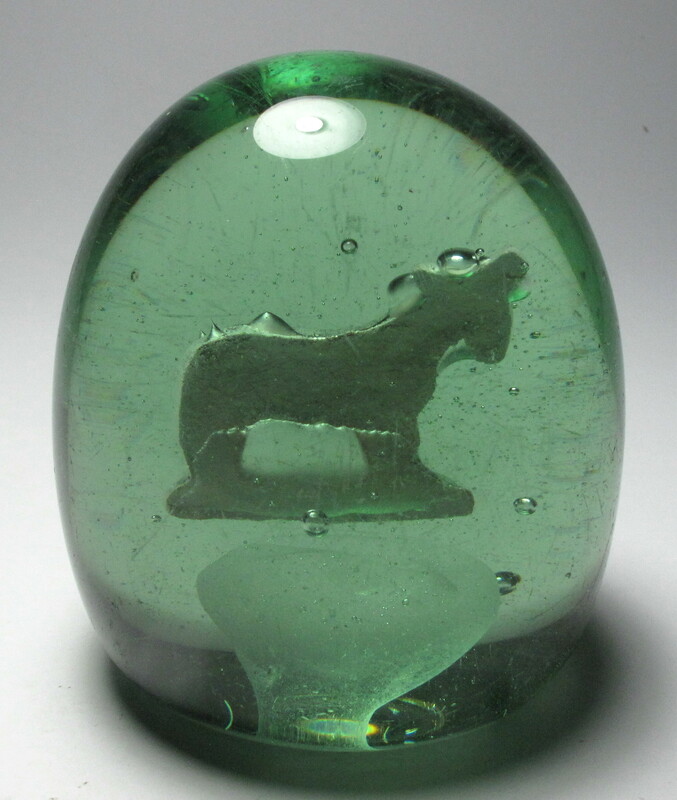 Magnum Antique English Green Glass Dump Paperweight with Sulphide Goat. circa 1840-1900. 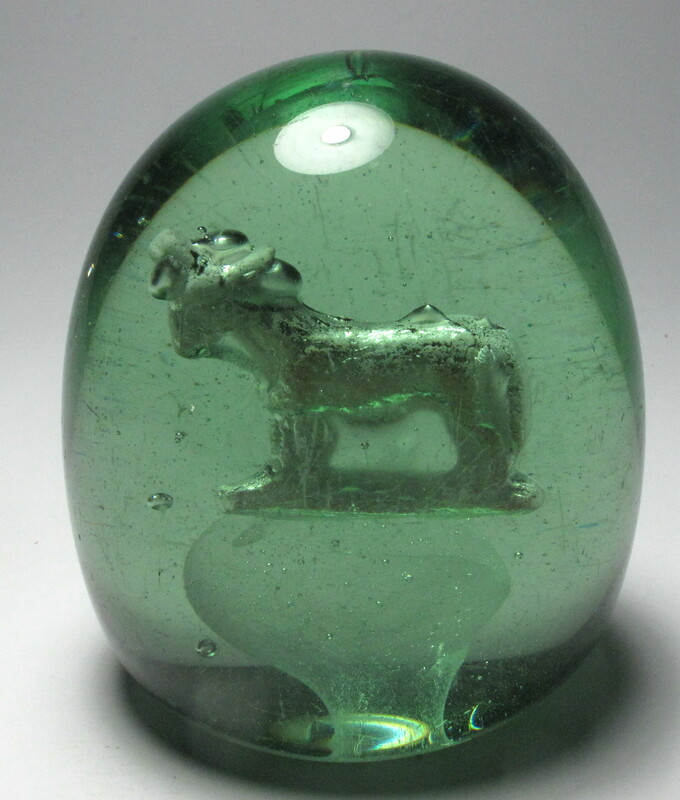 This unusual glass paperweight is made of green bottle glass and contains a sulphide of what appears to be a goat with horns. There is also a flowerpot on the bottom of the type typically find in floral dumps. I have no idea why the maker put that in. 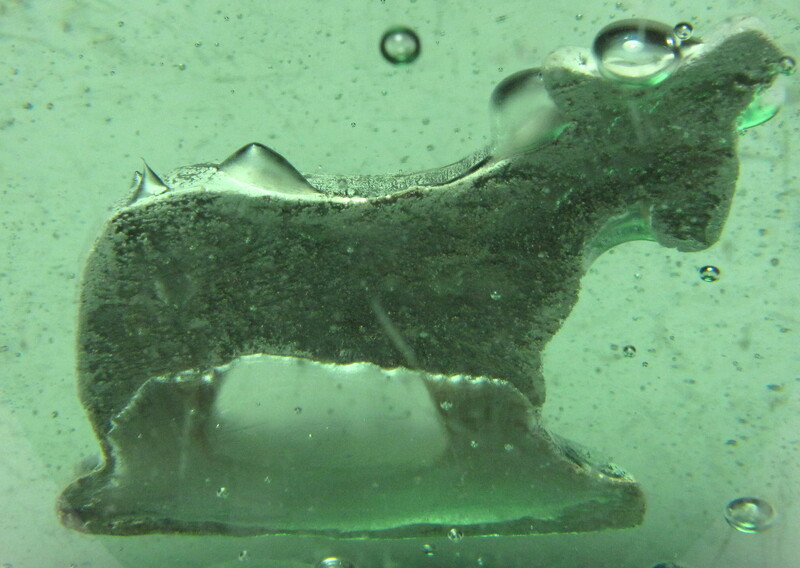 The goat sulphide has many small and larger bubbles on its surface. These were trapped when the sulphide was inserted. Unknown maker and age. It has considerable surface wear and scratches. Also base wear consistent with its age and two small circular impact marks. No cracks or chips (other than the two impact marks). There are many fine bubbles in the glass. A great addition to a collection of old English paperweights. 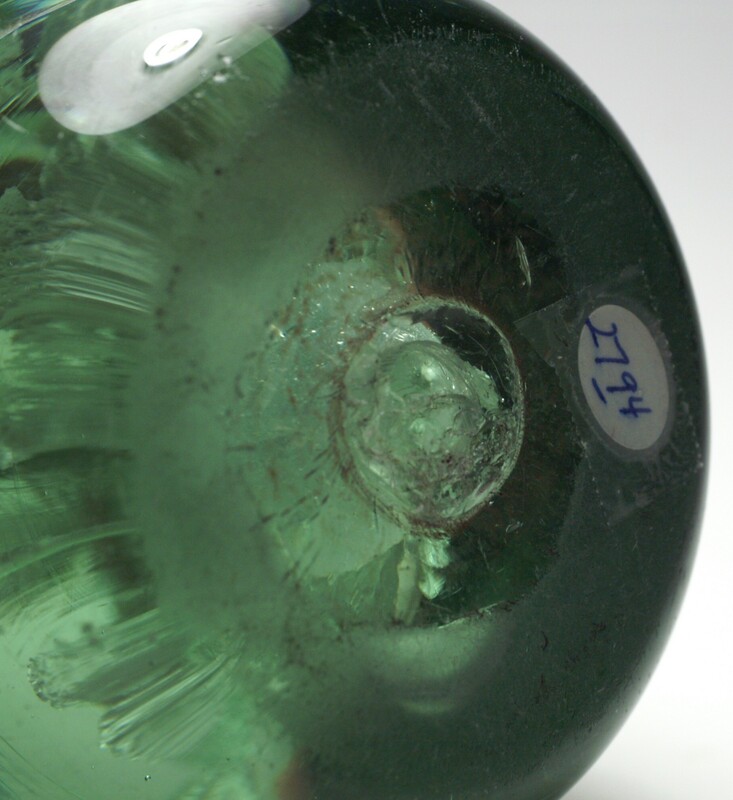 Green glass paperweights, mantle ornaments and doorstops originated as early as 1820 and continued to be made as late as 1914. 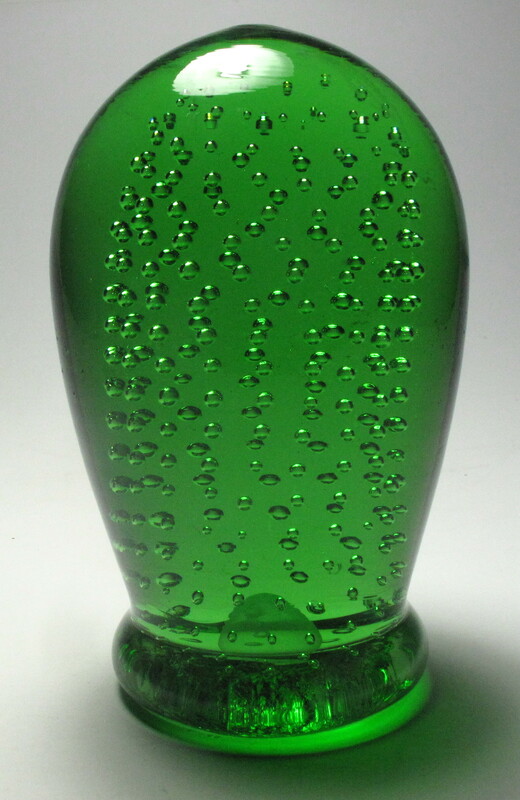 They are made from green and blue bottle glass in factories founded by John Kilner of Wakefield and other bottle makers in the Midlands and Northern regions of England. There are articles on this topic in 2002, 2003 and 2005 annual bulletins of the Paperweight Collectors Association. You can also read about them in Old English Paperweights by Robert Hall. Often referred to as green dumps, the most desirable are those with well executed floral designs, sulphide inclusions, or colored flowers. Even more desirable is a signed example. 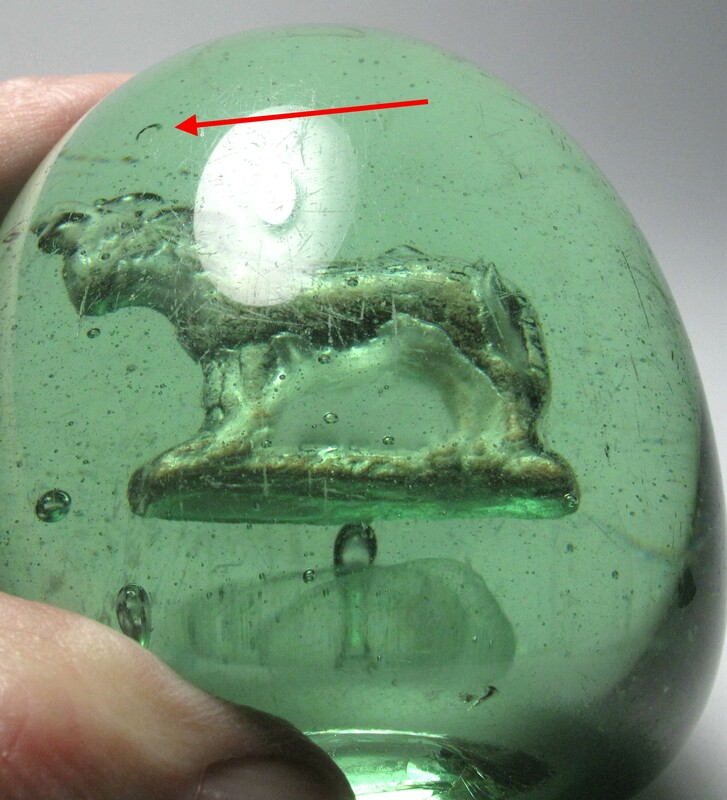 Since they are made form bottle glass, these paperweights often show signs of rough handling with chips or internal fractures. Sulphides are cast objects (animals, flowers, people) made of a ceramic material that has properties similar to the surrounding glass. They are normally white, but are also sometimes colored or even painted. The objects are cast in a mold that copied or made directly from a medallion, coin or sculpture. The finest French sulphides are cast in a mold made by a skilled artist. Sometimes a sulphide will have a silvery appearance due to a thin layer of trapped bubbles between the glass and the sulphide itself. 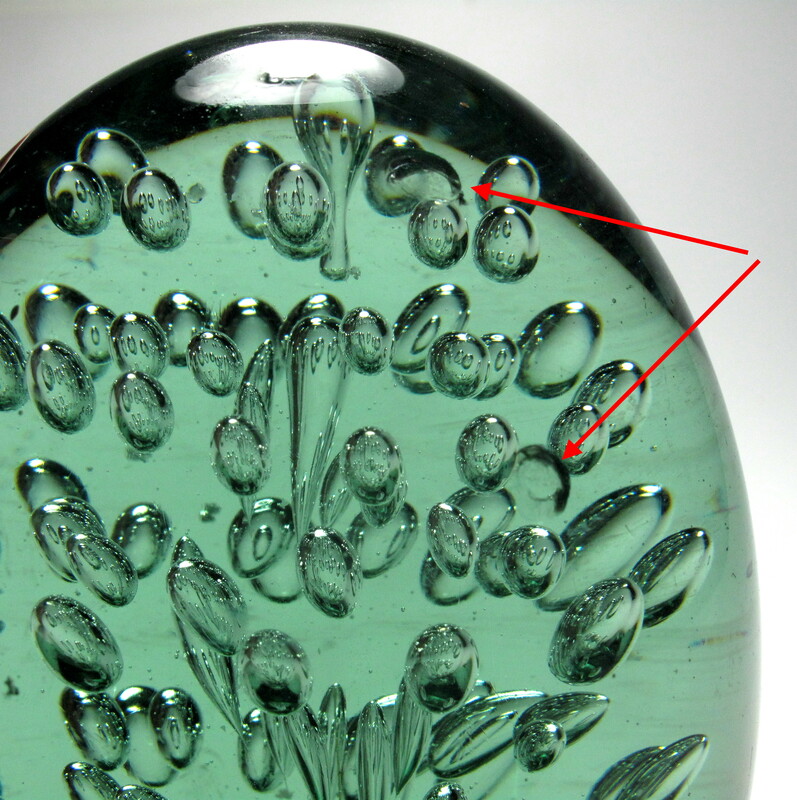 The sulphide can also have larger bubbles if the maker was not careful, as is the case with this example. 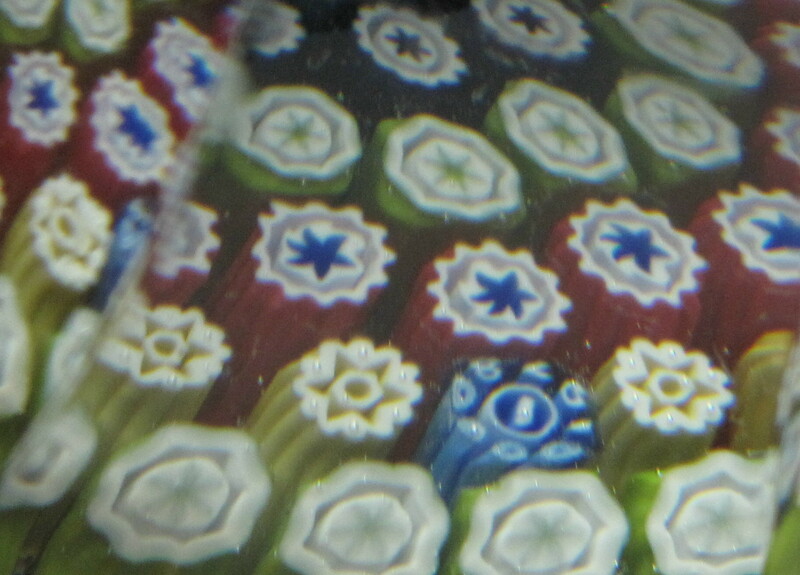 Note: I had difficulty getting good pictures of this paperweight, because of the bubbles in the glass and the wear on the surface. Very Large Size: 3 1/2" tall by just under 3 1/4" diameter. Condition: Good condition. 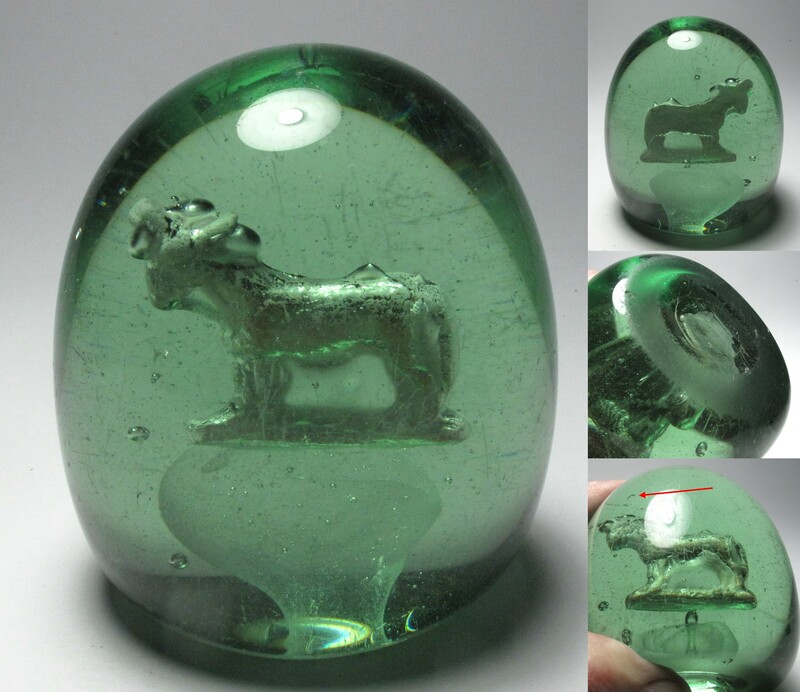 As is typical for this type of paperweight, it has surface and base wear and scratches. It also has two small circular impact marks. No cracks or chips (other than the two impact marks). The bottom has a the remnants of the pontil mark and also has considerable wear. 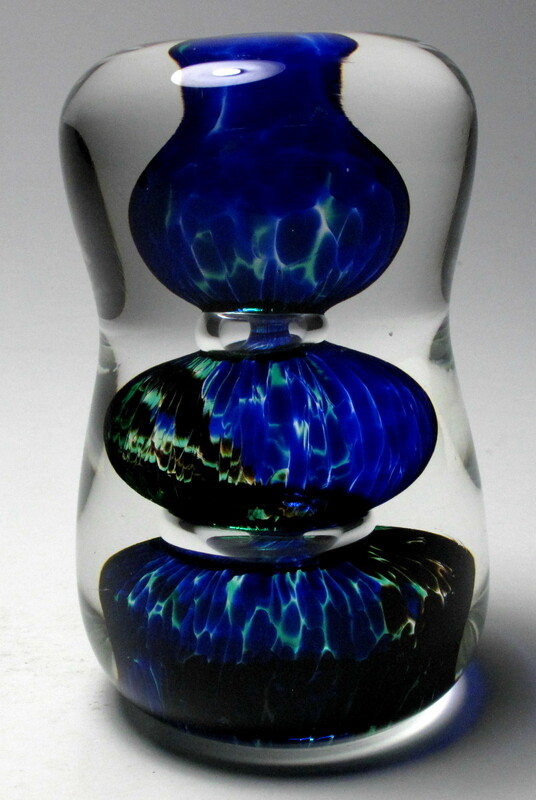 3442 Magnum Whitefriars 1980 Pattern 9894 Blue Swirl Abstract Paperweight. circa 1980. 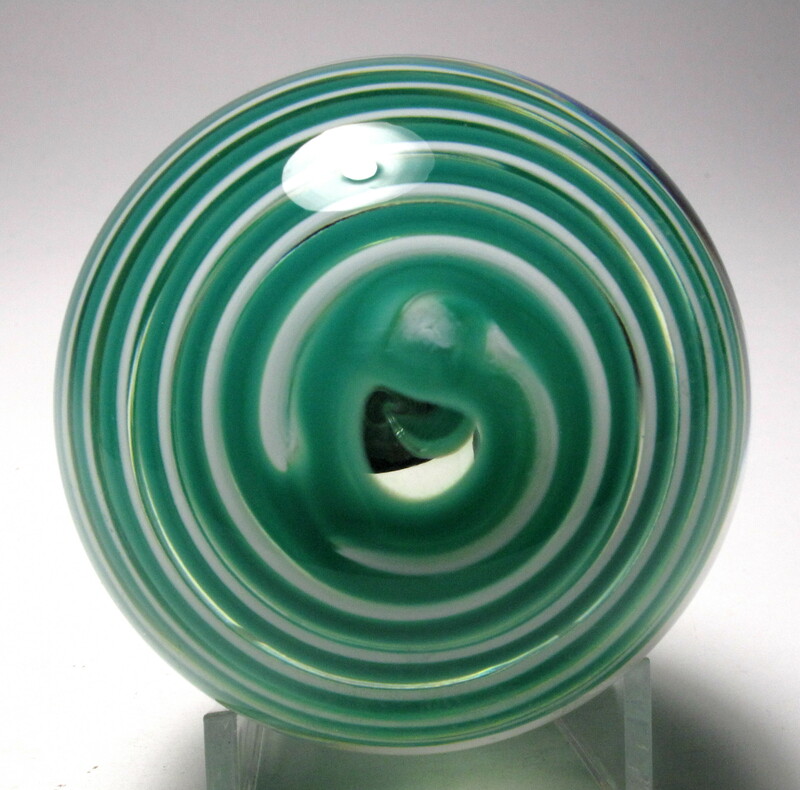 This paperweight has a distinctive swirl pattern created by picking up colored cane pieces. There are elongated bubbles all around the side and a single bubble in the center on top. 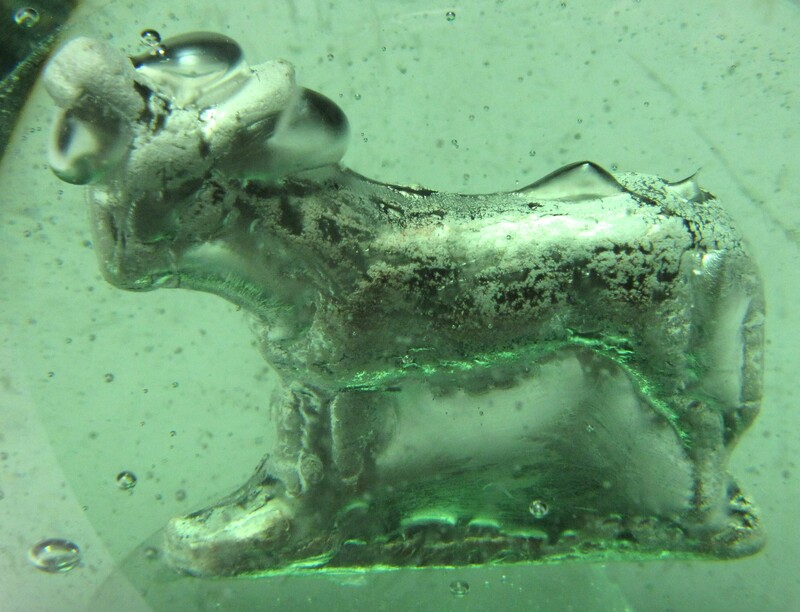 Typical heavy Whitefriars lead crystal. This is pattern 9894. It is unsigned and does not have its original paper label. 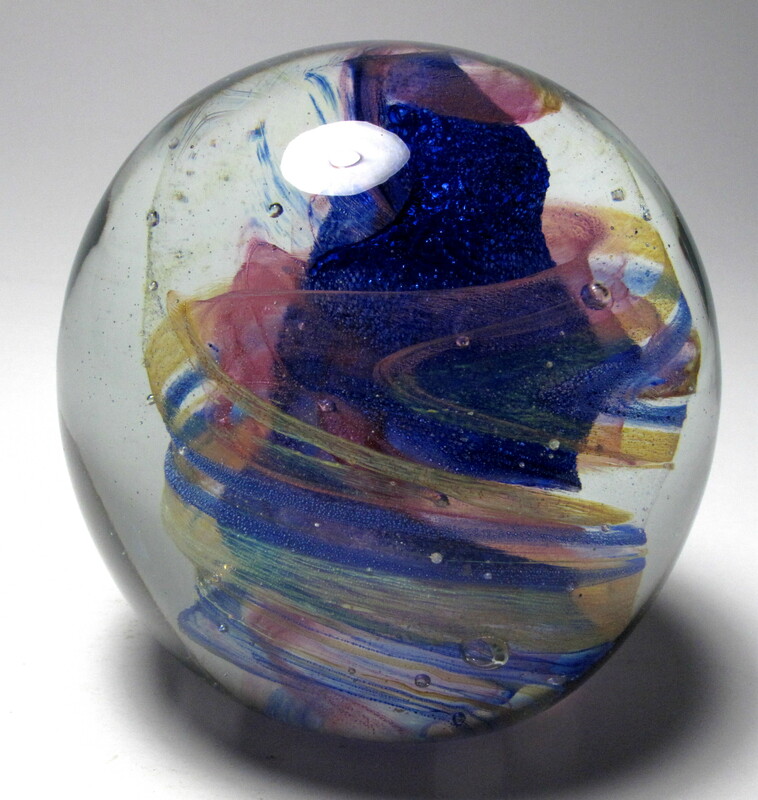 Note: The Whitefriars Paperweights Collectors Guide by Brian Slingsby and Judy Taylor refers to this style of abstract as "Bubble and Streaky", but I prefer to call them swirls. Bubble and Streaky came in four styles and a variety of colors and were made in the 1978 to 1980 time frame. Very Large Size: 3 1/4" diameter by 2 1/2" tall. The bottom is ground concave. This paperweight is heavy and weighs just under two pounds. Condition: Excellent condition. No chips, cracks or scratches. Signature: Unsigned but this is guaranteed to be Whitefriars pattern 9894 from about 1980. 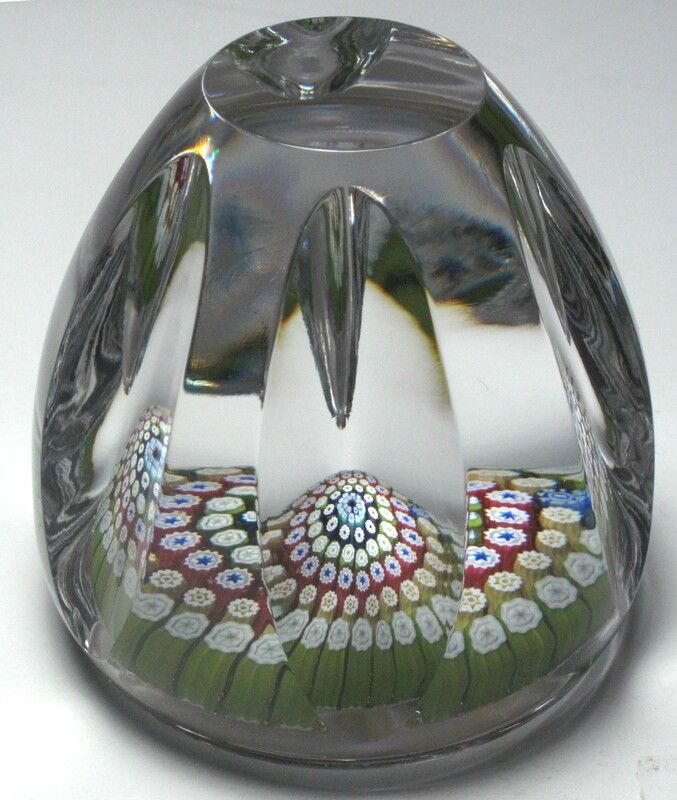 2202 Whitefriars 1978 Cone Shaped Faceted Concentric Millefiori Paperweight. dated 1978. 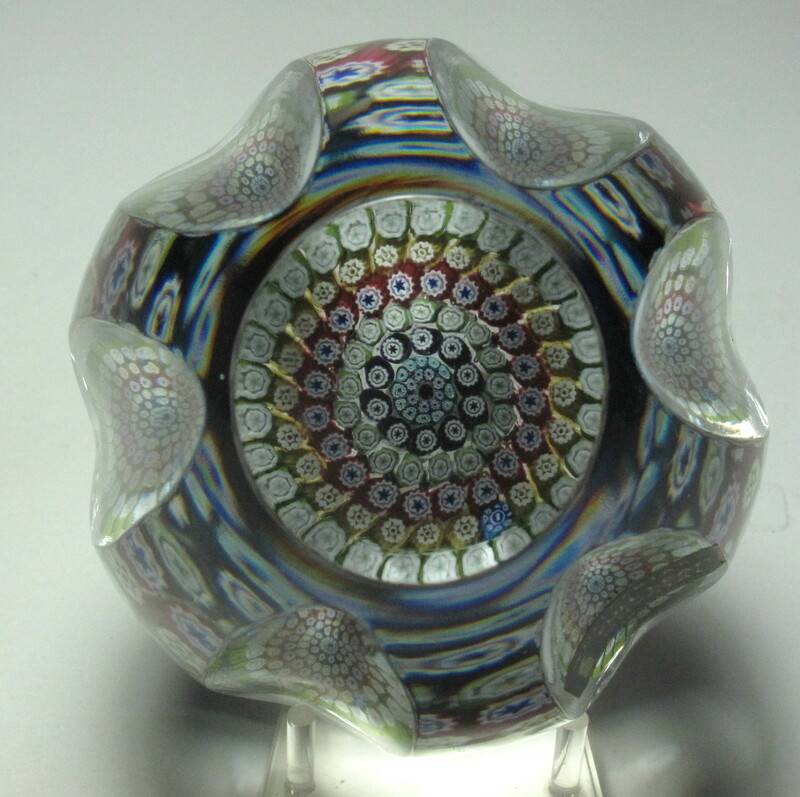 This paperweight has five concentric rings of star and cog canes (green, yellow, red, green, and purple) around a complex center cane. The center cane consists of two additional rings of millefiori. There are six elongated side facets and one top facet. 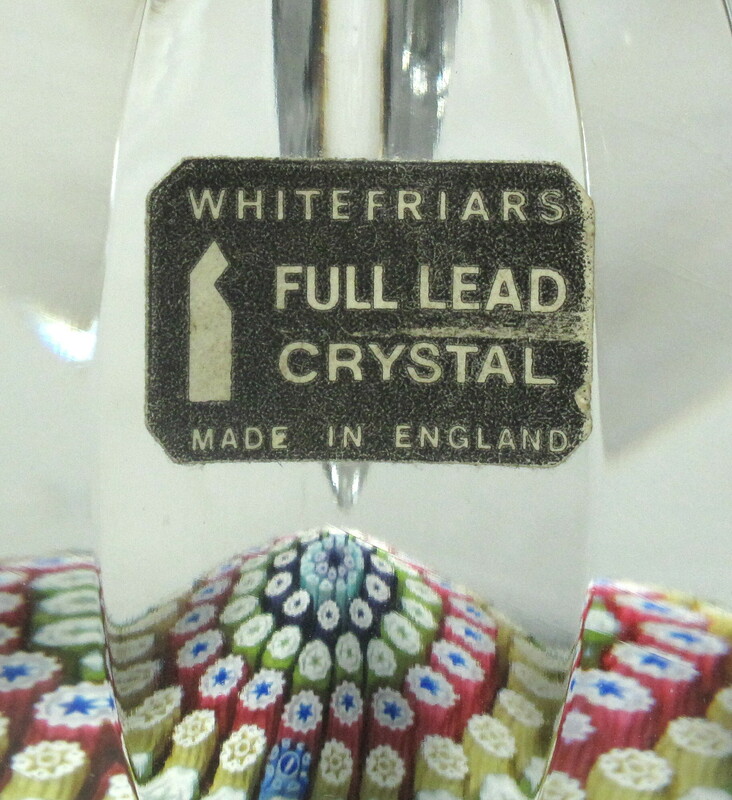 Typical heavy Whitefriars lead crystal. It is signed in cane with a Whitefriars signature cane with a white monk and the date 1978. 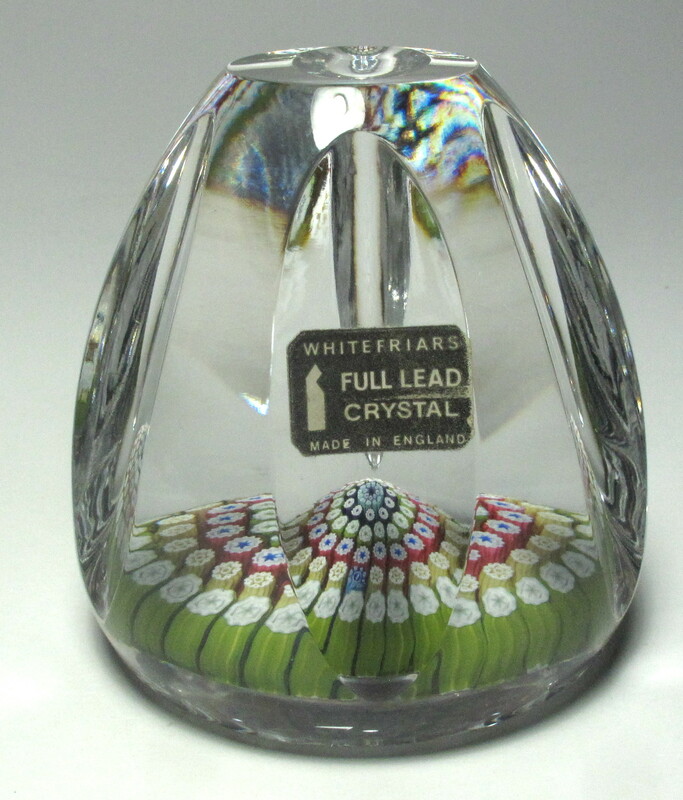 There is also a paper label "WHITEFRIARS FULL LED CRYSTAL MADE IN ENGLAND". Large Size: 3" diameter by 3" tall. It is faceted with one top facet and six side facets. 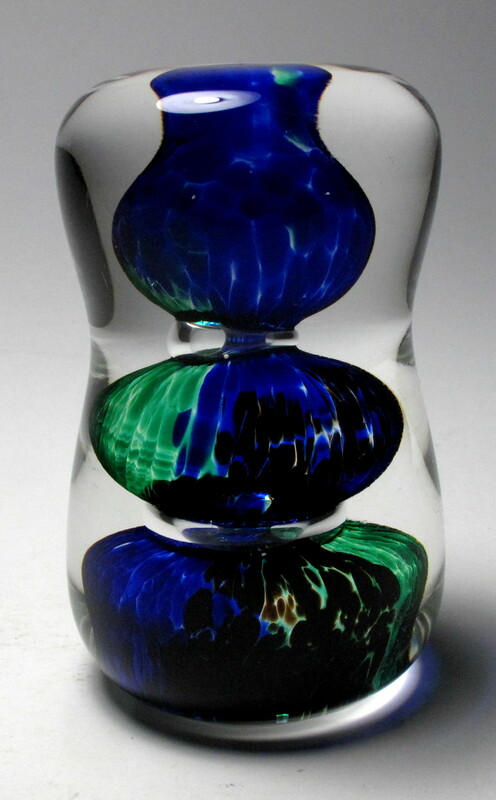 The bottom is ground concave with the millefiori set close to the base (typical of Whitefriars weights). Signature: Signed with a Whitefriars signature / date cane showing a Whitefriar and the date 1978. It also has the Whitefriars paper label. 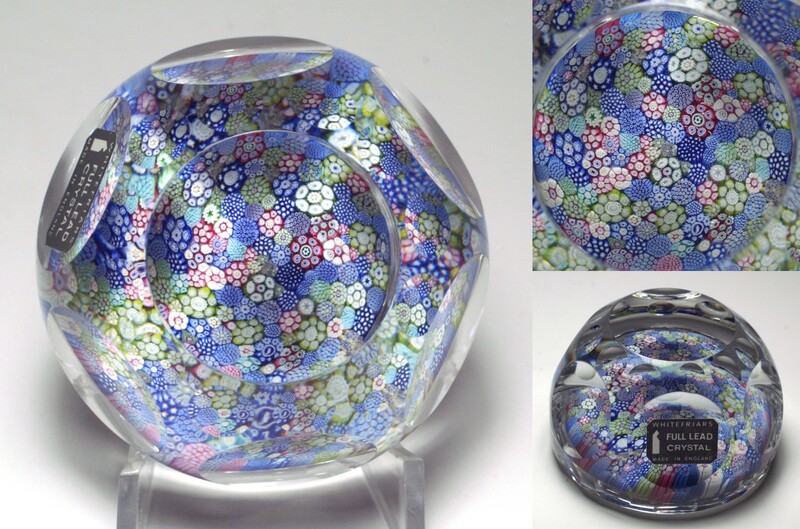 2786 Large Whitefriars 1978 Closepack Millefiori Paperweight. circa 1978. Wonderful design with many elaborate complex millefiori canes tightly packed into rich mosaic of canes. Faceted with one top facet and a total of 24 side facets in three rows. 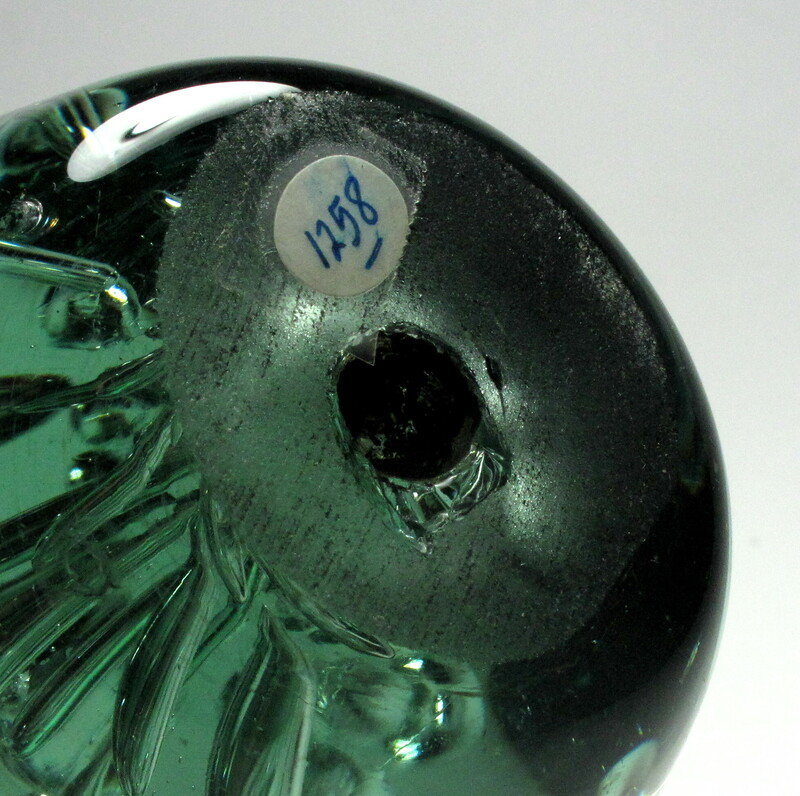 There is a Whitefriars signature cane with a white monk and the year 1978. It also has a Whitefriars paper label. It comes with its original round Whitefriars and cardboard outer box. Signature: Signed in cane with a Whitefriars 1978 cane and also has a Whitefriars paper label. It comes with its original Whitefriars round box and cardboard outer box. 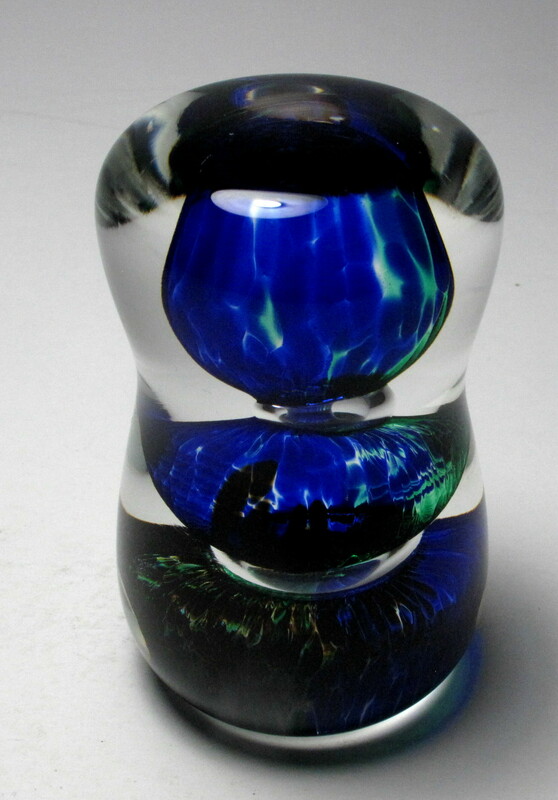 2196 Vintage Magnum Whitefriars Paperweight Inkwell. circa 1920-1930. This magnificent inkwell has a concentric pattern in both the base and the top. 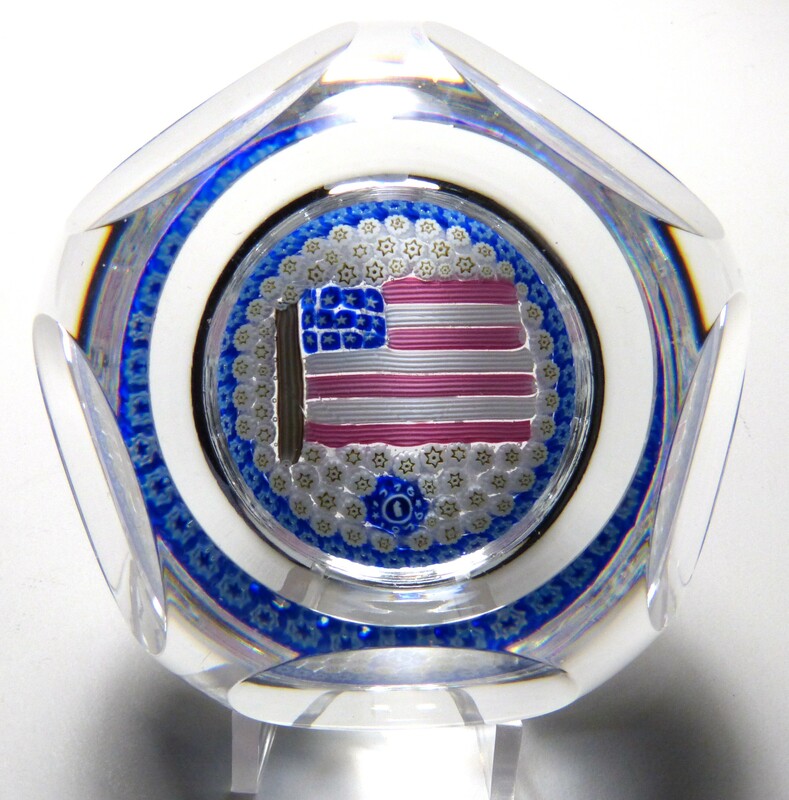 The base has six concentric rings (blue, white, pink, blue white, pink) around a central floral cane. 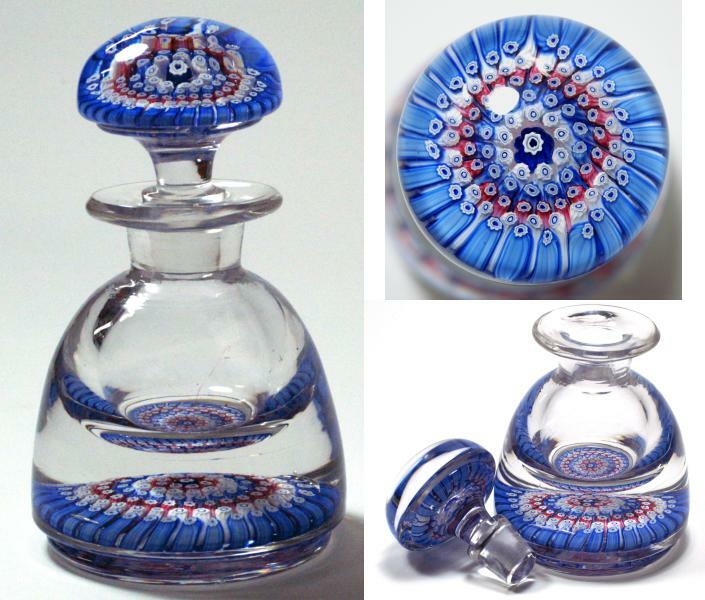 The stopper top has five concentric rings (blue, white, pink, blue, white) also around a central floral cane. The centers of many of the pink and blue canes are heart shaped, but I cannot be sure that was the maker's intent. It may be a distortion. The white canes have a five lobed floret in the center. 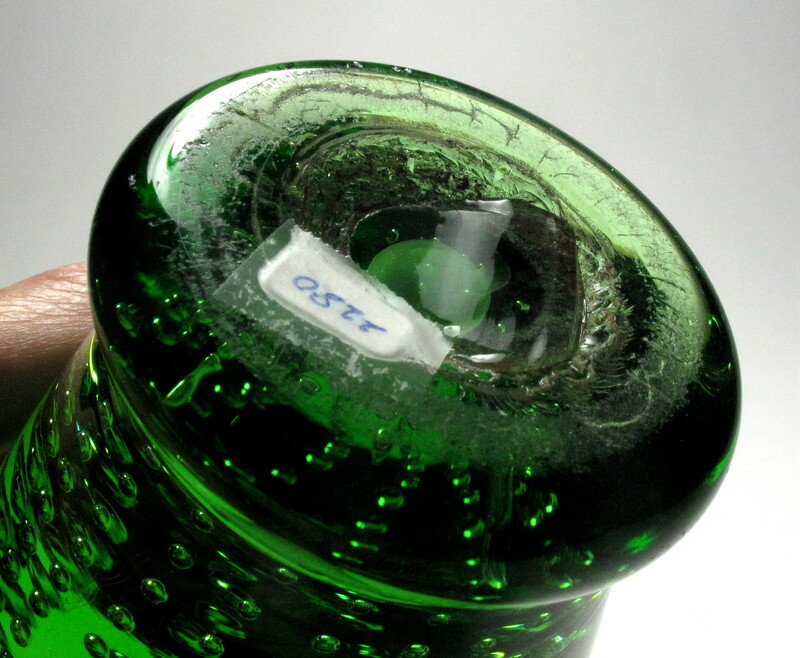 There is also a slight foot at the base of the bottle. This is probably the product of the Arculus or Walsh-Walsh factory. Very Large Size: 3 7/8" diameter by 6 1/2" tall. Excellent condition with no chips or cracks. There are a few bubbles in the glass including two long bubbles near the base. 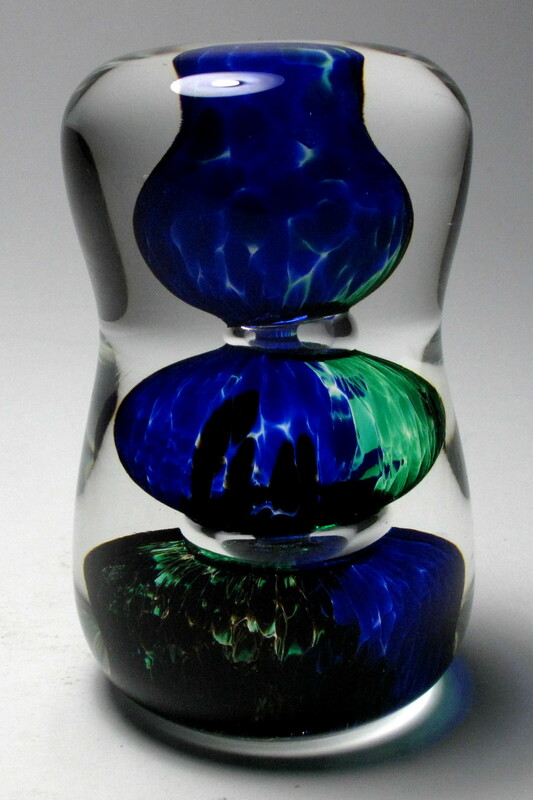 The bottom is ground concave with the millefiori set close to the base (typical of Whitefriars type weights). This type of bottle typically carries an estimate in the $650 to $1,000 range in Selman's auctions. 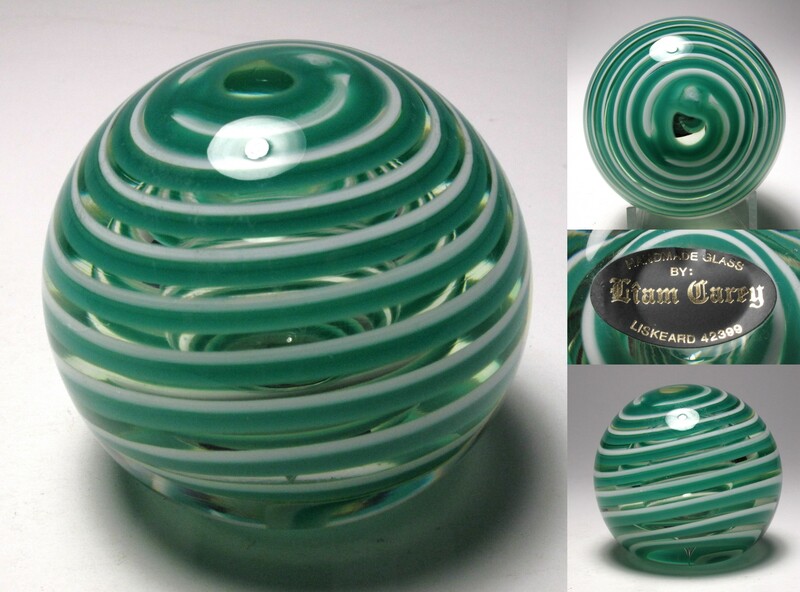 1258 Magnum Antique English Green Glass Bubble Dump Paperweight. circa 1840-1900. Wonderful antique English bubble dump paperweight. The controlled bubble arrangement looks like a fountain of bubbles. This particular example is in almost flawless condition, although it does have three circular impact marks - one of which is very faint. Very Large Size: Just over 3 5/8" diameter by 4 3/4" tall. The bottom is partially finished. Condition: Has two 1/4” diameter circular impact marks plus another smaller faint one. Otherwise in excellent condition. 4689 Colorful Avondale Vertical Paperweight from Kilgetty near Tenby SW Wales UK. This is fun item. 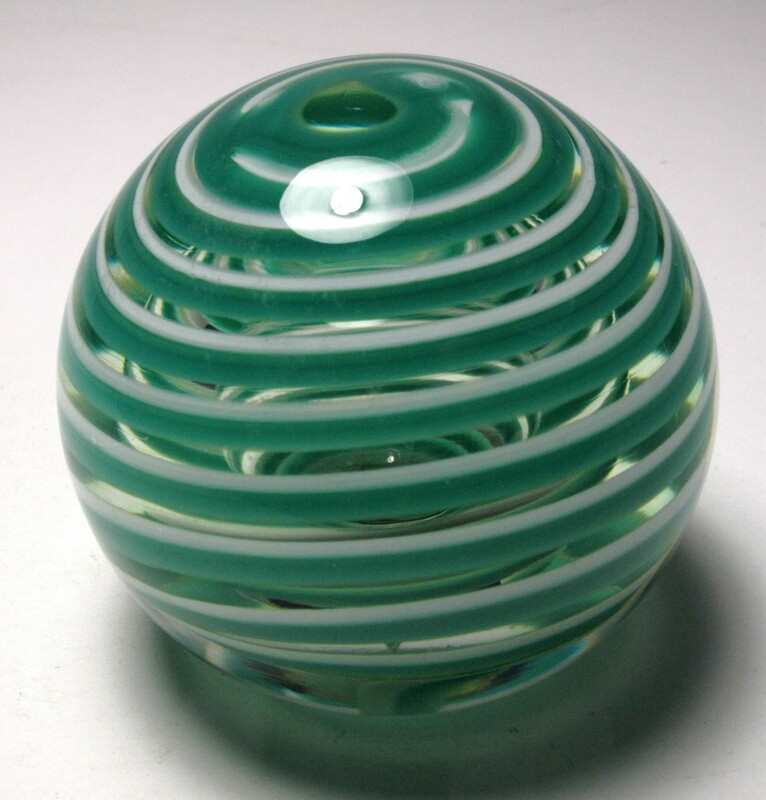 A vertical paperweight with three colorful green and blue spheres separated by spacers of clear glass. It was made at Avondale Glass in Kilgetty Wales (near Tenby). It is not signed. A fun paperweight. Note: Special thanks to Cameron McBurnie who identified this as an Avondale product. Avondale glass is no longer in business although there is a small craft shop on the site where Avondale glass is sold and demonstrations are sometimes scheduled. Size: 2 1/16" diameter by 3 1/4" tall. The base is finished flat. Condition: Very good condition. Two small scratches found near the base. No other chips, cracks or scratches found on inspection. Signature: Unsigned, but I will guarantee this as a product of Avondale glass.